Many women don’t like to be called ‘feminist’ anymore. Some think the term’s outdated and no longer useful, because when we use it we remind people of, and thereby perpetuate, silly notions about women from the bad old days. Others think it’s too divisive, highlighting the differences between between men and women instead of emphasizing our much more important similarities, which was the whole point of feminism in the first place. I understand the distaste for the f-word. Second-wave feminists, continuing the fight for equality that the first wave had only partially achieved, sometimes overshot the mark in their zeal. 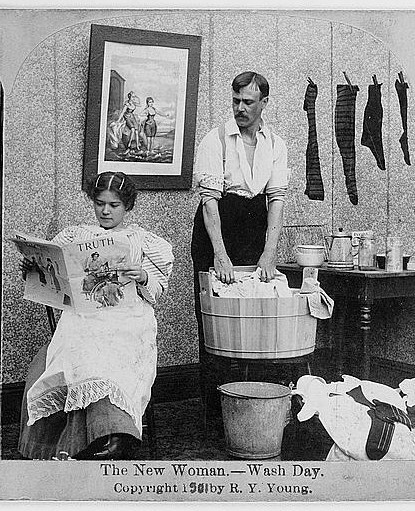 Some thought men had to be taken down a peg or several; others thought that greater separation of the sexes, rather than less, was what it would take to liberate women from men’s intransigent misogyny. Many even thought, and continue to think, that men and women are so fundamentally unlike in the ways they think and feel that they will never achieve true friendship and equality. I, like those who object to the term feminism, think that these separatists are wrong about human psychology, and am more optimistic about the improving relations between the sexes, especially as gender roles are losing some of their rigidity throughout the world. Though the recent flap over Cannes Film Festival’s kicking women off the red carpet for not wearing high heels might put a damper on this view, the fact that this raised such a huge outcry makes the whole story seem more like a point in its favor. Like the first wave feminists, I hold the view that the similarities between men and women so far outnumber the differences as to render them largely irrelevant, especially when it comes to human rights and political equality. The term feminism itself is a first wave feminist invention. There are many meaningful terms which make sense because of the history behind them, not because they make literal sense anymore. Take the term film as it’s used in ‘Cannes Film Festival’: it’s used to refer to movies in general. 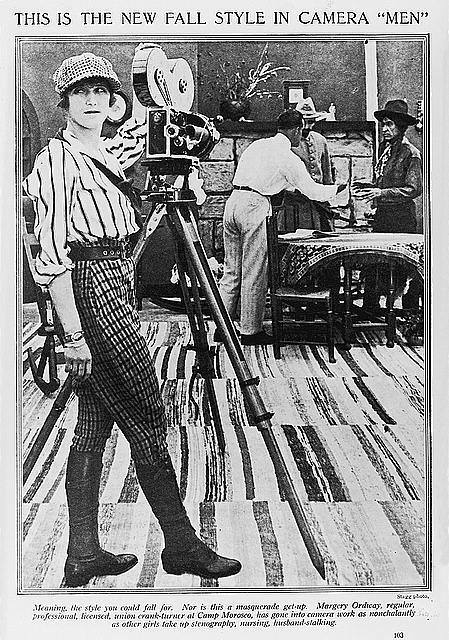 Yet actual film, that specially prepared plastic on which a multitude of images are imprinted to be played back later as a moving picture, are only sometimes used in movie-making today. Movie aficionados who now refer to movies as films don’t mean to imply that actual film was used in any given movie; whether or not it was, they wish to emphasize the craft and history behind the art of movie-making that they all share. The term under question here also has a meaning that’s evolved over time. Feminism expresses, in the words of that great old tongue-in-cheek slogan, ‘the radical notion that women are people’. Just as humanism was coined as a rallying word to promote the idea that human beings and their achievements are valuable for their own sake, feminism was coined to rally people to the cause of equal rights for women, since women possess the same defining qualities of humanity as men. At one time, it was necessary to prove that point. Now that we take women’s equality for granted in much of the world, feminism might seem antiquated or divisive. But I don’t think that’s really the case. Almost everyone is familiar enough with the current usage of the term film to know that what we mean now is not exactly what we used to mean, but we still like to use it because of the history it alludes to. Likewise, most people should be familiar enough with feminism to know it’s now generally used in the context of critiquing the more entrenched and obscure problems of sexism in our society, not to demonstrate the basic humanity of women or the depravity of men. So I still like to identify myself as feminist. Despite the blemishes some put on the term over the last century and a half, I value it because of the way it connects the current pursuit of equal rights and dignity for all to the brave and noble women (and like-minded men) throughout history who fought for their freedom, and mine, under its banner. 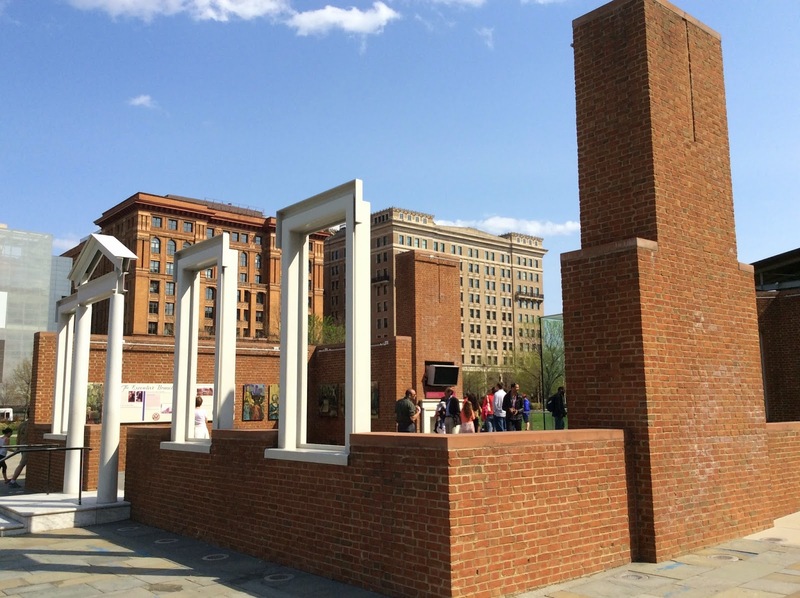 Thomas Jefferson Sites, Part 6: Charlottesville, and Last Day in D.C.
Sixth day, April 24th, 2015. Today, I’m heading south of D.C., and have only two destinations for the day, and that’s a good thing: it’ll take every hour I have to explore them, and make me wish I have more to spend. These places tell the story of what Thomas Jefferson’s all about more than any of the other sites I visited, with the possible exception of the Library of Congress (though he never visited the building, of course, since it was built decades after his death). And this time, I’m pleased to say, I have a travel companion, that very special person I told you I was meeting yesterday: my darling Dad, John Cools! He’s one of my very favorite people in the whole world, and I can’t imagine a better person to go on a history tour with. He’s also handsome, like his big brother Bob, who lives in nearby Falls Church and took me on the little driving tour on the first D.C. day of this trip. We drive to Charlottesville via the smaller highways that take us through the beautiful Virginia farmlands, lush and green and still colorful with wildflowers. We lose a few extra minutes getting out of town, since we’re so busy chatting and laughing that we miss a couple of turns. After these brief false starts, we’re on our way. Since I’m driving and absorbed in conversation with my Dad, I forget to ask him to be my photographer, and have no photos from the drive to share. However, I find a great one online that’s in the public domain; thank you, Emridout! Remove the hay bales, and you’re seeing more or less what we see during our drive. We arrive at Monticello, Jefferson’s stately home on the hill in Albemarle County, Virginia, just a few miles away from where he was born at Shadwell. (Monticello is Italian for ‘little mountain’.) His childhood home burned down when he was in his mid-twenties, and though I was tempted to find the site, I think it’s best to first see the main places we came to to see, and stop by Shadwell if we have time later. Turns out, we don’t. First, we head to the ticket machine for the house tour.We’re scheduled for a tour a few hours later, so we start with the museum. It’s an excellent one. We start with the exhibit which shows how Monticello was designed and built in stages. In fact, it was never really finished. Jefferson was an experimental architect, and I guess he’d be considered an amateur, in the sense that although he designed buildings, he wasn’t paid to do it for a living and he wasn’t formally trained. It was one of his lifelong interests, however, and at Monticello, he’d often build up part of the house, only to see a building or illustration which gave him a better idea. So, he’d tear part of it down from time to time, redesign, and rebuild it. Thomas Jefferson’s standing desk, in the Monticello museum. Doesn’t look like it would have been quite tall enough for his six-foot-two-inch self! My Dad is a construction superintendent and started out in his professional life framing houses and building room additions; he’s also built or assisted in building many houses from the ground up. He used to take us kids with him to work sometimes, usually one or two at a time, and we would play with the wood scraps and little round metal cutouts from electrical boxes (which make perfect coins for buried treasure). Dad often says how much he misses building with his own hands, but a superintendent commands a much better salary and he had a family to support, so a superintendent he became. If Jefferson were here, they’d have a lot to talk about. This exhibit is right up my Dad’s alley, and he pores over the displays in great interest. I’m interested too, but I’m more drawn to Jefferson’s standing desk displayed in the center of the room, as antique furniture is a little more my forte. It’s both elegant and practical; I would love to own it. With its tilt top and pull-out additional work surface, it’s just as great for the laptop and reference books I’m working with as it was for Jefferson’s pen and paper. My day job is in a medical office, and I often regret the number of hours I spend sitting down. This would be a perfect solution. We head for the gallery across the hall whose displays focus on the daily lives of all who lived and worked at Monticello. There’s a handsome bust of Jefferson at the front of gallery, and I find I like the face. It’s very expressive, a little handsome, with hair that looks awkward to my modern eyes, swept outward from either side of his face. I recall a portrait of Thomas Jefferson by Mather Brown, the first known portrait of him painted in London in 1786, which doesn’t look that much to me like the man portrayed in this bust or most of the other portrayals I’ve seen. A copy of this portrait hangs here at Monticello somewhere; the original is on display at the National Portrait Gallery in Washington DC. I’ve heard the Brown portrait described as more handsome than Jefferson in real life: he was tall, lanky, with red hair and freckles and a long nose. But I like the face portrayed in the bust much better: it looks a bit patrician but with rough edges, the face of an energetic man who spends a lot of time outdoors or doing something else interesting. The Brown portrait looks stuffy and a little haughty in comparison, and I never did like the powdered look. A project-oriented, outdoorsy man like Jefferson needed a toolkit, and we see a nifty one in this gallery. There’s a pocketknife, drafting instruments with a little silver case, architect’s scale, and most interesting to me, a sort of tiny notebook made of ivory. It fans out like a lady’s fan, and what’s nifty about it is that you can write notes on it in pencil, and then erase the marks by rubbing them off with your finger, making it available to use again. I use the Pages app on my mini iPad in sorta the same way during my travels. The gallery has many, many more great exhibits, way too many to picture here! Completing our tour of the museum, we grab a bite to eat at the cafe (they actually have very tasty, reasonably priced food, sometimes even serving vegetables raised in the restored Monticello gardens) and then head up the hill toward the house. It’s a nice little stroll, I think preferable to the shuttle, since it gives you time in nature to refresh yourself between the mental effort of taking in all that history; interesting as it is, it’s fatiguing after awhile, and the break is welcome. The path winds through a pretty little patch of woods, and it’s spring, so the leaves are still small and bright green, and you can see quite a ways through the trees and get a pretty good view of the lay of the land. The Jefferson family graveyard is about halfway up the hill to the house from the welcome center, and Jefferson, his wife Martha Wayles Skelton Jefferson, his mother Jane Randolph Jefferson, his sister Martha Jefferson Carr, and her husband, his brother-in-law and best friend Dabney Carr. Carr and Jefferson studied law together and both were members of the Virginia House of Burgesses. They were very close since childhood, and would hang out on the hill that would later become the site of Monticello, often reading and talking under the shade of a favorite oak tree. They promised that whoever died first, the other would bury him under that oak. Carr, sadly, died at the early age of thirty, so it was up to Jefferson to fulfill that vow. This graveyard grew up around that first burial, and over the years, his mother-in-law, nieces, nephews, cousins and other family, his wife Martha 38 years later, and finally Jefferson himself, were buried. The obelisk that is Jefferson’s tombstone towers high above the rest, and besides his name and birth and death dates, it’s carved with a list of his three proudest accomplishments: author of the Declaration of Independence and the Virginia Statute for Religious Freedom, and founder of the University of Virginia. Not the presidency of the United States, or his diplomatic service to France, or any of his other achievements in politics, scholarship, law practice, legislation, agriculture, science, architecture, invention, or philosophy, none of these made it onto that stone. Whatever his flaws, the fact that he directed only these three to be carved on his tombstone increases my respect for him quite a bit. Rights-based government; freedom of conscience; public access to a liberal education: it’s hard to come up with a list of three more valuable social goods. Jefferson did more than most to promote these in his lifetime; even where he didn’t carry out his goals or conceive of better ones, he helped lay the groundwork so that others could implement his ideals of a more enlightened, rational, humane society more fully. Dad and I pause, gaze, and reflect a little while here, then we continue up the hill. We arrive next at the gardens and Mulberry Row, where many of Jefferson’s slaves and hired contractors lived and worked, including his slave, departed wife’s half-sister, and mistress of 38 years Sally Hemings. The gardens and the Row run side by side to the south of the house. The gardens are fully restored, laid out in the same way as in Jefferson’s time in accordance with his notes and drawings, and as much as possible, grow what Jefferson’s farm grew, and are as carefully tended. Mulberry Row is a fascinating place: there’s been extensive archaeological work done, with many of the foundations of the original structures laid bare and described by signs, interspersed by a few reconstructions. Most of the buildings on the Row burned down or were pulled down when they fell into disrepair, but there are a few structures still standing that are original. On the west end of the Row stands the chimney and bits of the walls of the joiner’s shop, where the fine woodworking was done: wood molding, furniture, carriages, doors, windows, and so on, from wood that had been imported or felled on the plantation and cut into lumber elsewhere, then brought here. If he needed skilled work done, the practical Jefferson would hire an expert, often from Europe, then apprentice one of his slaves to him so that they could provide the same services in the future. For example, Sally Heming’s half-brother John Hemings became Monticello’s master woodworker after acquiring the skill under the tutelage of David Watson, a hired Scotsman. One creative and lovely use of one of the crumbling structures on the Row is Uriah Phillips Levy’s mother’s gravesite wall. Levy believed that great people’s homes should be preserved in their memory, and as the first Jewish naval officer in the U.S. who also advocated for religious liberty and against flogging, was a great admirer of Jefferson’s. So, he bought Monticello in the 1830’s to restore and preserve it. When his mother died here, Levy buried her here in this site overlooking the gardens and vista of the woods and green farmlands below. There are two buildings on Mulberry Row that are original and still more or less intact: the workmen’s house which at some point became a small textile factory, and one of the stables. The workmen’s house / textile workshop was first built in the 1770’s, and the stables in 1808. The latter was originally a larger, L-shaped building; this is what’s left. We’re so absorbed in exploring Mulberry Row that we almost don’t notice those that the few hours we had to wait to tour the house had quickly passed. We scurry on over to join our tour group. Monticello is preserved and run by a private non-profit, the Thomas Jefferson Foundation, and many of the artifacts contained in the house are on loan by private collectors. The tour guide explains that since the Foundation has not received permission from the owners of all the artifacts, no photography is allowed inside. So I contact the Foundation and receive permission to use a limited number of the Foundation’s images of the interior. This may sound like heresy to many, but while Monticello is a very interesting and even impressive house, I don’t consider it particularly beautiful or graceful. It looks just like what it is: a concoction of an experimental architect who loves all things classical and equally loves invention and values practicality, constructed in a piecemeal fashion so that these two aspects of Jefferson’s taste are never reconciled. There are beautiful details and fine craftsmanship throughout the house, even some lovely rooms. But many of the elements don’t fully harmonize with one another and overall, it just doesn’t hang together. That’s fine by me: because it’s such a quirky place, very much a product of an individualist, I find it all the more interesting to explore, and I think it’s a really… well, nifty place. We enter the front of the house through a large portico with a pointed lintel, topped with a large weather vane. While the weather vane looks rather funny with the neoclassical design, it pierces the roof and attaches to a dial on the portico ceiling so that the detail-oriented Jefferson could step out onto the front porch and see which way the wind was blowing just by glancing up. There’s also a giant clock over the inside front door of the entrance hall, which tells not only the time of day but the day of the week, again, somewhat awkwardly. Since the weights suspended from overly long chains hang down through holes cut in the floor, he’d have to go down to the basement to check the day of the week on Saturdays and Sundays if his calendars hadn’t already alerted him. Again, over-the-top tech nerdy gear, still in the process of development, for the 18th century gadget-head. As we enter the entrance hall, Jefferson’s fascination with the natural world and the history of local cultures is manifest in the beautifully presented and preserved fossils and Indian artifacts that fill the room. Painted animal skins hang from the interior balcony, shields, spears, pipes, clothing, and the heads and skulls of animals hang on the walls, fossil remains of animals cover tables. Jefferson was an innovator and pioneer in many fields, including archaeology; he’s credited with directing the first scientific archaeological dig in the Americas. Among the busts and portraits that ring the room, his own is placed across the room from Alexander Hamilton’s, Jefferson’s ideological foe and political nemesis. While he long thought Hamilton’s political beliefs would spell disaster for the new republic if carried out, he ended up using some of Hamilton’s methods to accomplish his own goals as President, such as taking on more national debt to pay for the Louisiana Purchase. Hamilton was a Federalist, and believed that a strong central government, a standing army, industry, and a national debt were necessary for any nation’s success and the liberty and well-being of its inhabitants; Jefferson believed that a small national government, largely independent agrarian states, no standing army, and freedom national debt would accomplish these ends much better. Let that be a lesson to us, as I’m sure it was to Jefferson; it’s always important to remember that others many have insight we haven’t yet had occasion to see clearly for ourselves, and to be ready and able to change our minds when the circumstances reveal that we’re wrong. We pass thorough a pretty, small blue parlor to the next room that really represents something that Jefferson’s all about: the book room. You may be surprised that Jefferson had such a large library as this in his later years considering he’d sold all his books to Congress in 1815. But as he wrote to John Adams, he couldn’t live without books, so he promptly resumed accumulating more debt by building a new library. The book collection here is composed of only a few from Jefferson’s actual collection; the rest are identical titles that others had owned. The room does hold one of Jefferson’s actual high-backed easy chairs and an original portrait of Jefferson in profile by Gilbert Stuart, which Jefferson’s friends and family said looked more like him than just about any other portrait. Then through a beautiful, plant-filled, well-lit greenhouse and hobby room to Jefferson’s ‘cabinet’, or personal office, connected to his bedroom by two passageways. He was a busy man, disciplined in his reading, writing, and keeping of accounts, and wished to be able to get right back to what he was working on as efficiently as possible. So he devised two ways to get from one to the other: one, the standard little hallway which is the one we walk through and two, his alcove bed was set into the dividing wall, so he could roll out of bed to the left into his bedroom, or to the right straight into his office. It’s also the bed he died in, so there would have been plenty of space for his loved ones to bid him goodbye from whatever direction they came. I feel, for a moment, a little like an intruder, since Jefferson was a very private man in many ways, especially concerning matters of the bed, so to speak. But as he said, the world belongs to the living, not the dead, and we the living are here to learn from what he left behind. Jefferson’s office is an especially interesting and revealing room. It’s full of scientific instruments, an orrery (model of the solar system), a polygraph (a mechanical device which makes a copy of the letter you’re writing while you’re writing it), and gadget-y furniture, including a revolving bookstand which allowed Jefferson to quickly consult several volumes at once, an adjustable-top desk which could be raised, lowered, and angled to suit the needs of the moment, and revolving chair and table. My good friend Alex, who simply must to have or at least try out every new invention that comes along, would drool over this room. Like the entrance hall, it’s also ringed by portrait busts and images of his friends and influences, including George Washington, James Monroe, and, like Hamilton, a Federalist, but unlike Hamilton, a friend, John Adams. Adams and Jefferson met at the Second Continental Congress in 1775 and became close friends. While they shared a commitment to the Revolution and to the cause of political and personal liberty in general, they differed sharply in some particulars in how this could best be accomplished. Adams held a more pessimistic view of human nature, and thought that a free people needed a stronger government, stricter laws with greater social accountability, and a more aristocratic, pomp-and-circumstance-orientated leadership to inspire and impress. Jefferson held a more optimistic view of human nature, and thought that the people could be trusted to govern themselves if mostly left alone, with government interference only when people infringed on one another’s natural rights. Both emphasized the importance role of education, believing that an uninformed and uneducated populace would always remain vulnerable to exploitation and oppression. Adams thought it should be fully financed at public expense, and Jefferson was a founder of the American system of public higher education (more on that shortly). We pass through many other interesting and handsome rooms, including the parlor, lined floor to ceiling with portraits, again of Jefferson’s friends and influences. If I were to describe all the rooms in detail, this account would go on far too long, so I refer you to Monticello’s website’s excellent virtual online tour, or better yet, go see it in person! I assure you, you will not be disappointed. Leaving the house, we chat just a little with some other tourists. Since we all want photos of ourselves and our companions in front of the house, we oblige one another in turn, and I pose with my handsome Dad and favorite travel buddy. We pause for a little break outside, and take in the view looking down from the hill at the scenery all around. Peering through a little break in the trees, we can see, far off in the distance, our next destination after Monticello. But we still have some exploring to do here. Monticello is also composed of an L-shaped wing on either side of the house, with the long ends extending past the rear portico. These wings are set below the house, built into the base of the hillock the main house is on with the entry doors facing out, and connect with the basement on either side; the roofs of each these wings form a terrace. At the tail end of each L, there’s a two-story brick building, or pavilion. The south pavilion was the first finished house structure at Monticello, composed of two rooms, a combination bedroom and sitting room over a kitchen. Because Shadwell had burned two years earlier, Jefferson moved into this building in 1772, before schedule, with his new wife Martha and his infant daughter, also named Martha but called Patsy. They lived in this little house for nearly two years, until the main house was built up enough to be habitable in 1794. We head on down below the terrace. The basement and both lower wings of Monticello house more slaves’ quarters, the smokehouse, the dairy, the kitchen, the wine cellar and brewery, the ware room, stables, the wash house, a privy, and numerous other rooms, all full of interesting exhibits showing how a large plantation community raised and produced food, ran a great house, manufactured goods for sale and for consumption, and so on. Again, I very, very highly recommend a visit! After thoroughly exploring this fascinating place, we realize that a couple more hours had flown by and we needed to skedaddle if we were to reach our next destination in time to tour it in daylight. We wind our way down the hill toward the University of Virginia, which Jefferson founded in 1819. As aforementioned, you can see the domed roof of the Rotunda between the trees from Monticello looking northwest. I’d bet he kept the trees trimmed from time to time in that direction so that he could look upon what he considered one of the most important accomplishments of his life. As were so many of Jefferson’s brainchildren, the University was an innovative institution. It was nonsectarian; it was among the first to adopt the elective system; it focused on educating students qualified entirely on the basis of merit, not wealth or social standing; it emphasized the study of the sciences as well as the humanities; and it was built as an ‘academical village’, which emphasized a close association between instructors and students but with private lodgings for the latter, facilitating peaceful study and healthful rest. When we arrive, it’s not exactly peaceful: it appears we’ve caught the tail end of a daytime festival, with tents and booths scattered around, groups of students standing or lolling on picnic blankets, and a live band playing. The center of the University is arranged around a grand rectangular Lawn, where the festivities are winding down, with the Rotunda Building at the head. It’s a very handsome building, modeled after the Pantheon and exactly half its height and width, where Jefferson much more successfully married the local red brick look with classical design than at Monticello. Jefferson not only designed the Rotunda (with help), he designed the Academical Village, many of the other buildings, the overall layout, even, as I discover on a plaque on one of them, the whimsical wavy garden walls. The University is a lovely place to stroll, built on hilly green grounds with lots of trees, enchanting little gardens tucked behind student buildings, many containing interesting sculptures or old architectural relics. One has at its center an original ancient, heavily weathered stone spire from Merton College at Oxford dating from 1451. It’s about to turn Friday evening, and the students are out in droves to start off their weekend dressed to impress, laughing, chatting, and jostling their buddies. My Dad and I wander and chat, discussing what I had learned before the trip of the history of the University and its architecture. It also works out well that our visit coincides with the Rotunda building’s restoration, since, as aforementioned, my Dad has spent his life working in construction. Even though we can’t see the interior, we can observe the process of restoration as well as see many of the Rotunda’s underlying structures exposed, which he finds very interesting. We learn various other interesting facts as we explore; there are historical markers aplenty throughout the college grounds. Part of the grounds of the University is located on the site of Jefferson friend and colleague James Monroe’s old farm, one sign explains. Another informs us that Edgar Allen Poe attended for one term in 1826, dropping out because his adopted father would not pay all of his debts. Imagine becoming so famous that briefly attending and dropping out of a prestigious university would earn you a historical marker there! Dusk arrives, and it’s time to seek out dinner before the two-hour-plus drive back. It’s been an excellent day, and I couldn’t ask for better company. If you couldn’t tell already, I’m a bit of a daddy’s girl. In the course of the day, we visit the National Museum of American History of the Smithsonian, where I make sure to visit the American Presidency gallery. I find some Jefferson artifacts among the collection, including the original portable desk on which he wrote the Declaration of Independence (which I already know is here, having visited the Smithsonian some years before), and a great little snuffbox from the early 1800’s painted with Jefferson’s likeness, which I don’t remember from my earlier visit. There’s one more stop I do have to make before I finish my Jefferson tour. Of course, that’s the White House. While he didn’t list his Presidency among his proudest accomplishments, Jefferson’s time in the White House significantly influenced the way the United States government would function in the future. Though he downsized the size of government following Washington and Adams’ Federalist administrations and reduced the national debt, he increased it again with the Louisiana Purchase and adopted Federalist (or in today’s terms, big-government) policies when he deemed it necessary for national security or the well-being of the nation as a while. He insisted on entertaining foreign dignitaries in a egalitarian and casual manner, with everyone free to seat themselves where they liked rather than being seated according to importance, and insisted on being addressed like any ordinary citizen, without honorific. The latter innovations, while initially shocking and offensive to European sensibilities, helped set the tone for American cultural egalitarianism as well as the spread of democracy in the centuries ahead, even if only in their tiny way. While Jefferson stooped to some shady political back-handedness during his bid for the presidency (estranging his friends John and Abigail Adams in the process), he struck the right tone in his First Inaugural Address in 1801 when he said ‘…Every difference of opinion is not a difference of principle… We are all Republicans, we are all Federalists.’ We could all use a little more of Jefferson’s rational, conciliatory idealism amidst the partisan bickering, conspiracy-theorizing, extremist, unkind rhetoric that over-saturates our public discourse today. So ends the account of my Jefferson travels. But in following in his footsteps, learning more about his life and thought, and putting it all together in a narrative, many questions arose and trains of thought were initiated. There will be many more reflections on Jefferson to come in future essays, you can be sure of that. *Listen to the podcast version here or on iTunes. ‘Gilbert Stuart’, article, National Gallery of Art website. Hirst, K. Kris. History of Archaeology: The Series. About.com. Jefferson, Thomas. Writings. Compiled by The Library of America, New York: Penguin Books. ‘Short History of the University of Virginia’, University of Virginia website. I was engaged in conversation the other day with someone I like very much and whose opinions I respect, yet with whom I often disagree. This is a very good thing: these are the sort of discussions that keep us honest. They force us to confront arguments and evidence we hadn’t considered before. They challenge us to recognize our unjustified assumptions, things we’ve long taken for granted and never thought to question. And over time, they instill in us the habit of forming good quality arguments that withstand such challenges, and discard those that don’t. These are valuable lessons which we don’t learn so readily in discussion with like-minded people, in preaching to the choir, so to speak. That evening, we were mostly discussing politics, history, and social issues. Over the course of the evening, I found my interlocutor often supported his arguments primarily with anecdotes, as we all often do. Anecdotes are invaluable discussion tools: they illustrate what we mean by taking the argument out of the realm of the abstract into concrete reality, or in other words, they bring the argument to life. But over the course of the evening, I found that for nearly every anecdote he presented, I thought of one in support of a counterargument. Now it just so happened that some of the topics under discussion were sensitive issues, and since we were in mixed company and everyone was on holiday, I was loathe to bring up anything that would cause strong discomfort or hurt feelings, so I held back. But I wish I had asked him to clarify this crucial detail: did he mean to use these anecdotes as illustrations, or as evidence? If he was using these anecdotes to illustrate the larger points he was making, well and good. If he was using these anecdotes as evidence of how stated facts or general rules were manifested or broke down in particular circumstances, well and good. And if he was using these anecdotes as evidence of how particular circumstances can give rise to unique results, again, well and good. Yet, the fact that I could easily think of a contradictory anecdote for every one he presented weakened his arguments in my mind as he was making them, in those cases where he was arguing in favor of truth claims about the world as a whole. That’s because he hadn’t made is clear how he was using these anecdotes to support his claims. We should keep this in mind every time we make an argument: an anecdote, considered on its own, should not be considered evidence when it comes to general rules, facts, or theories. Generally, we should be hesitant to rely too much on anecdotes when we want to persuade others of the truth of what we’re saying.Why? Well, the world is a complicated place, with innumerable factors to consider when making a judgment on any given situation. So while any one anecdote can show how a particular array of circumstances can lead to a specific outcome, it doesn’t reveal enough about what can happen given another particular set of circumstances, or what usually happens in the world as a whole. Now, suppose someone where to discuss cats with me, and based on my close acquaintance with Stinky, I were to argue that cats are slow, ungainly creatures with no teeth, that they are dirty animals that don’t groom themselves, they always weigh less than eight pounds, and if you were to hear a low rumbling sound, you can bet it’s a cat. My interlocutor would justifiably think I’m a little nutty. 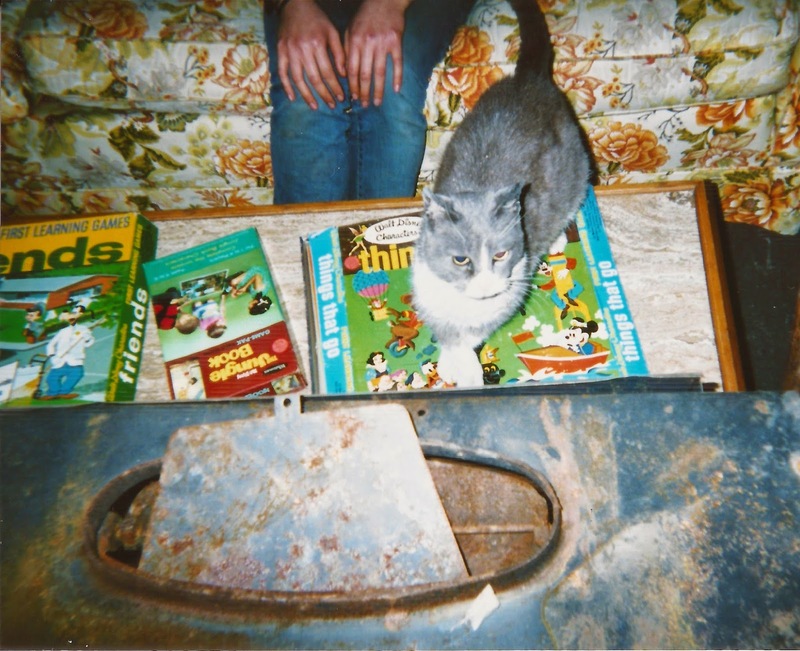 When it comes to talking about one cat, an anecdote is very revealing. When it comes to talking about the species cat, not so much. In other words: one cat is an anecdote, but lots of cats are evidence. While all this might appear obvious, it’s natural for human beings to form beliefs and to argue on the basis of what we’re familiar with: we all have our own sets of experiences from which we draw our ideas about the world. Yet, as we grow in knowledge and understanding, it’s important to gather as much information as we can about the world that goes beyond our own experience, since we lead ourselves astray all the time by relying on anecdotes, or in other words, the limits of our own experience. The anecdote can point us in the direction of where to seek for truth, since it reveals facts about the world in that particular time and place, but on its own, can’t tell us much about larger truths or how the world works as a whole. Statistics are evidence. Meta-studies are evidence. One study can be considered useful evidence if it’s sufficiently large and well-conducted, but given so many variables in the world and the statistical likelihood of getting skewed results in any one given study, it’s better to rely on meta-studies, or a hypothesis or theory supported by many studies and observations over time. Returning to the anecdote with which I began this piece to illustrate my argument: given the evidence of the many discussions we’ve had over time, I have every reason to believe my interlocutor that evening is an intelligent person, well-informed in many ways. Given my confidence in his abilities, I also believe he’s fully aware of the difference between anecdote and evidence. Yet, since our evolved brains naturally think first in terms of our own experience so that we easily fall into the anecdote-belief trap, we need to keep in mind the difference between anecdote and evidence, use them appropriately, and make it clear to ourselves and our partners in discussion how we’re using each of them to support our arguments and why. I map out my route, then make a timely departure from my temporary home this morning: I have lots to do before I meet up with someone very special this evening, and I don’t want to be late. I’ll be traveling today by car, since I have so many places to go throughout the day that aren’t close to one another, but that’s okay, none of my destinations are downtown. I start with Kalorama, site of an opulent home belonging to Thomas Jefferson’s friend and fellow statesman Joel Barlow, who purchased the property on Jefferson’s advice in 1807. Barlow made extensive additions and improvements to the house originally on the site, and Jefferson, always the enthusiastic gardener and improver of homes, offered his advice for the gardens and orchards too, and visited the estate many times. Kalorama, by the way, is Greek for ‘fine view’. The mansion and its associated buildings are long gone, the main house finally torn down in the late 1800’s to make way for city expansion in that area. The intersection of Massachusetts and Florida Avenues where I was directed to by one source, and where I park, turns out to be closer to where the gatehouse stood at the entrance to the grounds. The main house actually stood closer to 23rd and S Streets. I explore the streets and alleys about a block radius to the north and west of where my car is, and an alley I photograph seems to be oriented in the same direction as the gatehouse used to be, but south about a block. 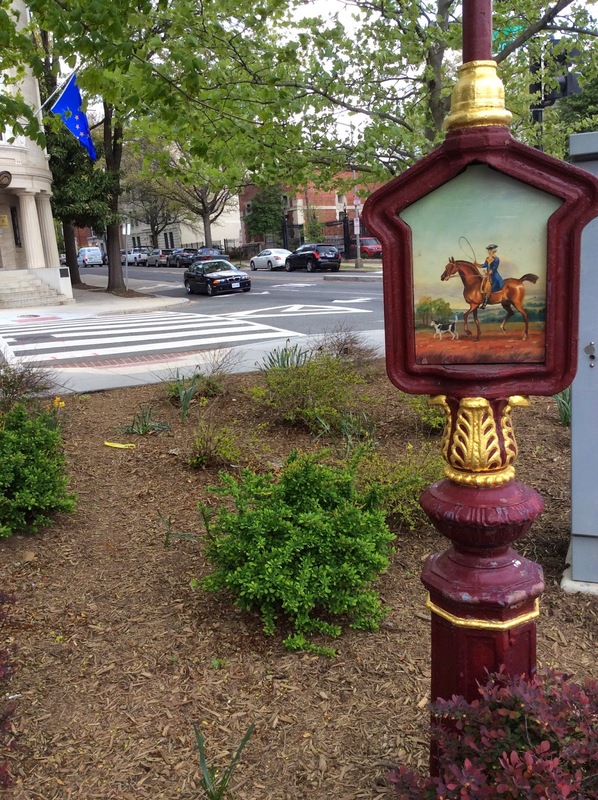 In my poking around, I find this great little antique call box, painted by Peter Waddell, who specializes in images of 18th and 19th century Washington’, according to the little plaque on the back. It portrays George Washington, who never lived in D.C.; his nephew, however, is the man Barlow bought Kalorama from. 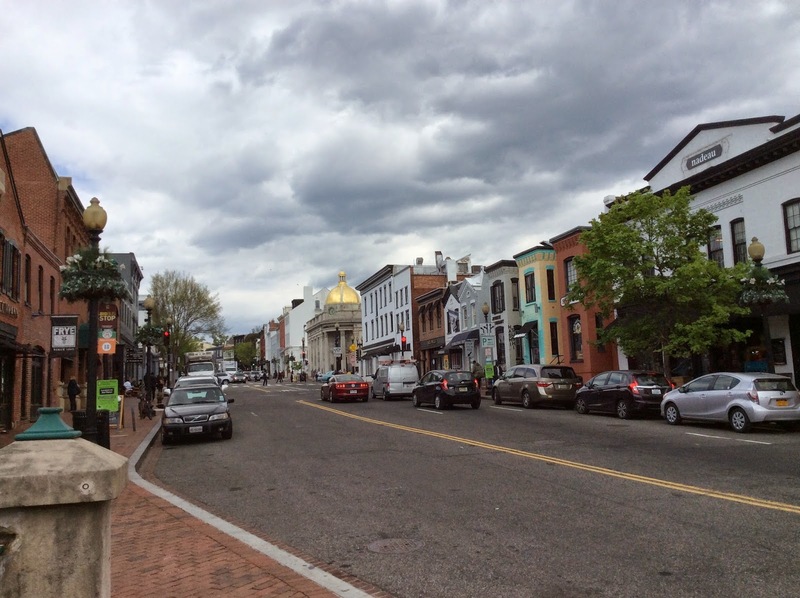 My next destination is Georgetown, formerly known as George Town before it became a district of D.C.. It’s now known for the university of the same name, its history as a commercial and industrial center for the area, its canal, and its elegant shops and restaurants. 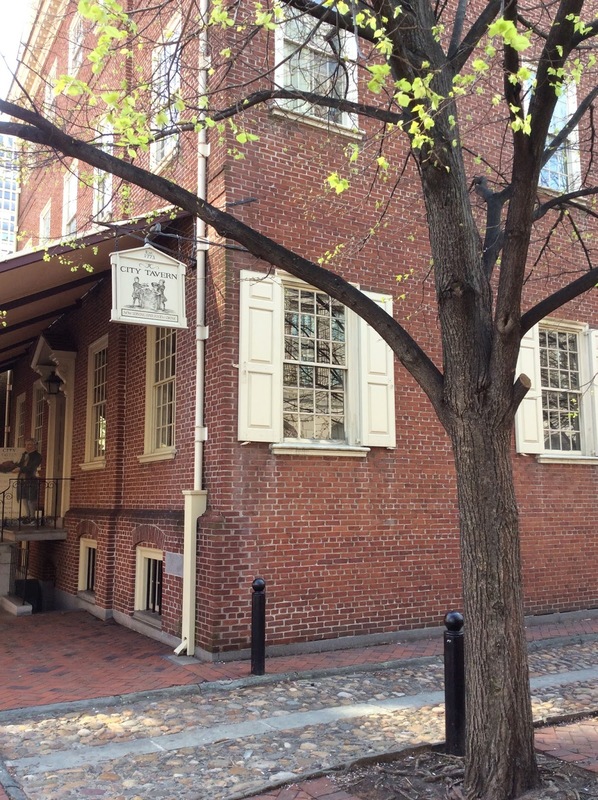 I’m headed first for the site of Suter’s tavern, where Jefferson stayed on his travels back and forth from Philadelphia, and wrote of the delicious glasses of wine he enjoyed there (Jefferson loved wine). There’s nothing apparently left of that building, either, except many stories, since it was a very popular inn at the time and many famous people stayed there. There are also many claims that it’s actually still standing (including one made by a business that’s in the building in question. Marketing tool?). There’s an old photo, supposedly of Suter’s tavern in the Library of Congress, but it seems that neither the photo nor the rest of these claims can be substantiated. John Suter, the proprietor, didn’t actually own the building, so there are no property records to back any of these claims up. From what I can find, it seems there’s a consensus that it was probably on or near what’s now Wisconsin Ave just north of the canal. 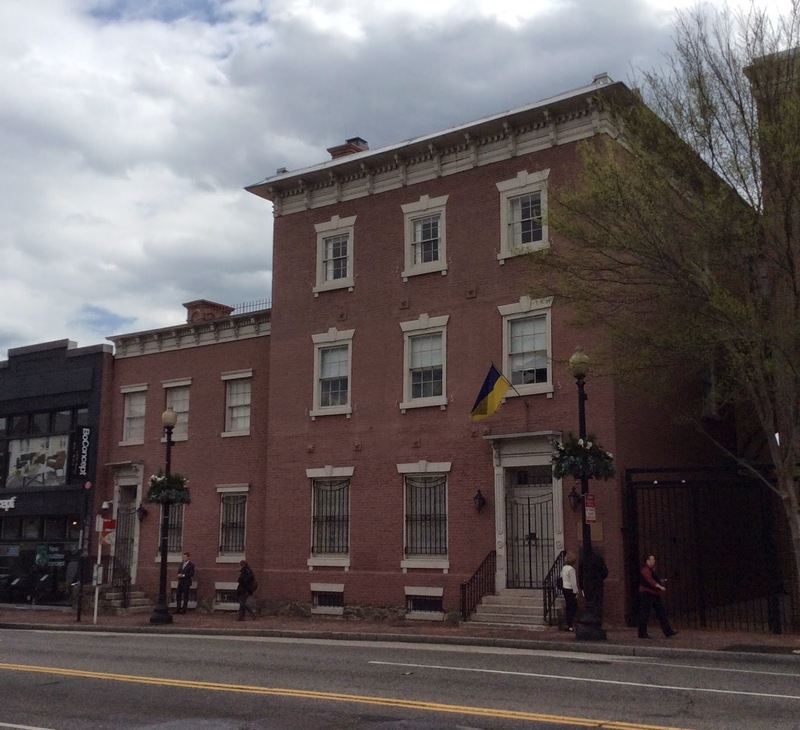 I continue on my way to my next stop: Uriah Forrest’s house, AKA the Forrest-Marbury House, AKA the Ukranian Embassy. 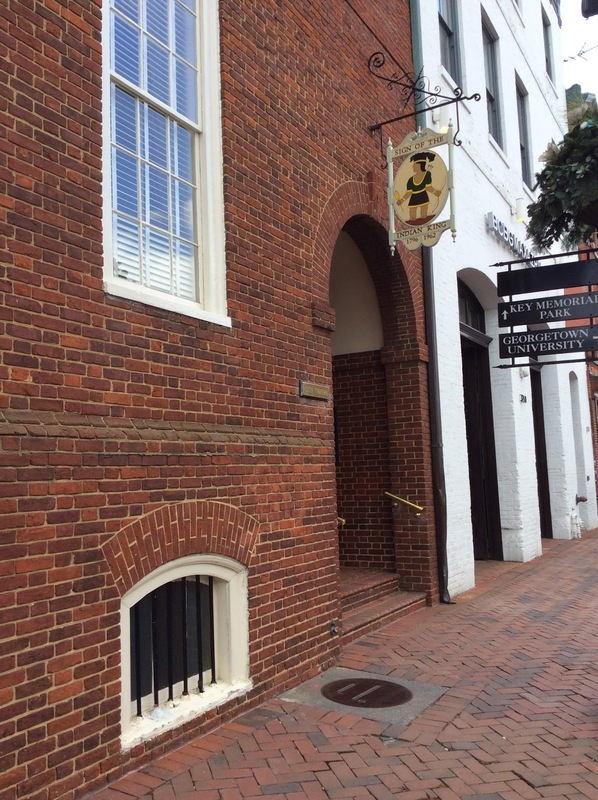 Jefferson dined at Forrest’s house and apparently stayed the night, along with Madison and others (though my primary source for this indicates that Jefferson spent the night in Georgetown, it’s not clear whether it was elsewhere, such as nearby Suter’s, or this house). They were on that same trip that took them to nearby Notley Young’s house visiting local landowners in preparation for building the new capital city there. 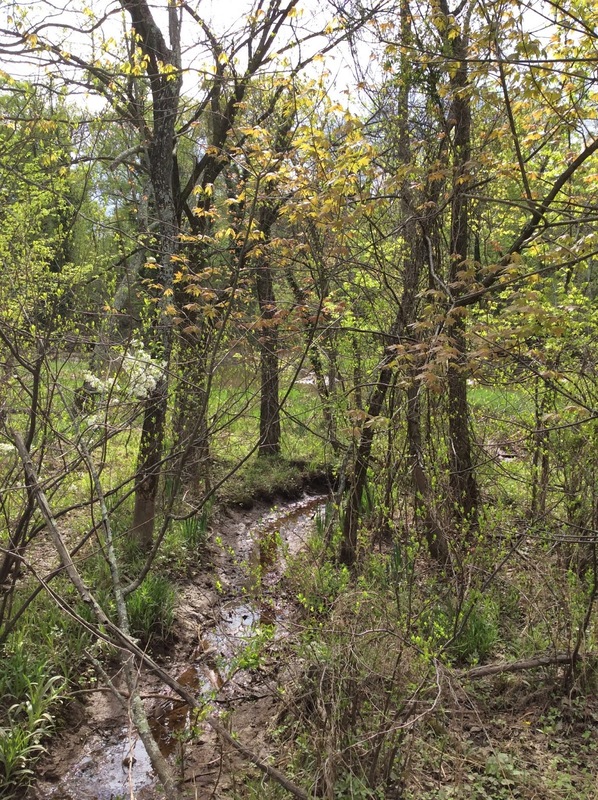 Jefferson and company took the time for a little pleasure trip, to take a tour of the area and visit some small waterfalls about four miles away, according to a letter of a contemporary describing the day’s outings. While the house is named for Uriah Forrest, who was one of the party when Jefferson was there in 1790, he actually didn’t live in that house yet; he moved in in 1792. Another member of the group did, the original owner who had it built in 1788, Secretary of the Navy Benjamin Stoddert. Like so many of the other Federal style buildings featured in this series, it’s a tall, somewhat plain but still handsome house of red brick. It’s one of the few buildings that date before the turn of the 19th century still standing in Georgetown. 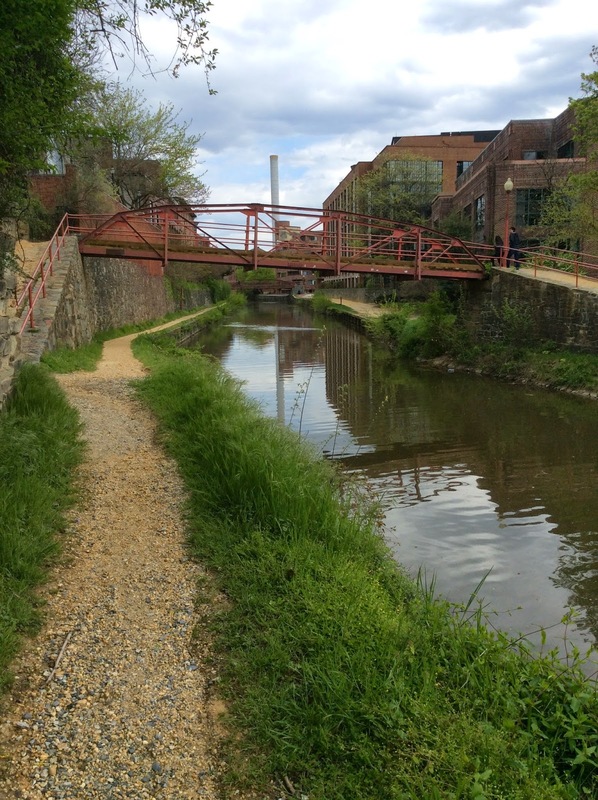 I decide to take the long way back to my car, via Francis Scott Key Park and the canal walk (I’ll add a photobook with more images of Georgetown soon). It’s a lovely stroll, via simple gravel paths along either side of the grass-lined canal, crossed by steel bridges painted that same rusty-red color of the Golden Gate bridge in San Francisco, and hemmed by old red brick warehouses, industrial buildings, and stone walls. Georgetown, originally a port town and trading center along the Chesapeake & Ohio Canal, became a bustling industrial center in the 19th century. Over time, the railroads and then flooding rendered the canal useless as a shipping route. After my happy stroll, I continue on to my final destination of the afternoon before the person I’m going to meet arrives. 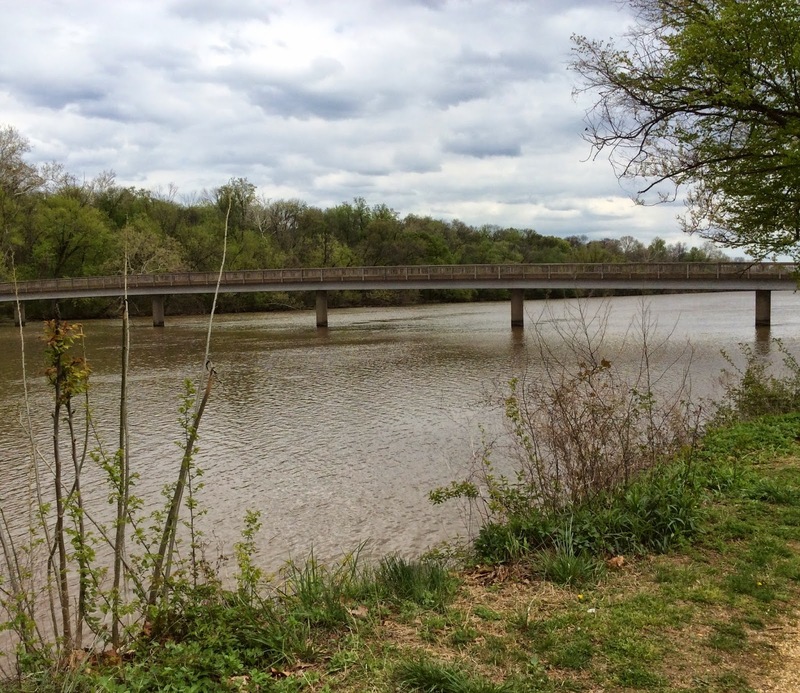 I’m heading for Analostan Island, which I had stood over, but not on, when I attempted to reach it by the Interstate 66 bridge footpath a few days before. This time I’m successful, but reach it very circuitously, as I miss the turn at the other end of the Francis Scott Key Memorial Bridge that would put me on George Washington Parkway, and end up going around and through Arlington National Cemetery. But I’m okay with that: I like getting lost sometimes, I find out interesting things that way. As I mentioned earlier in this series, Jefferson visited Analostan Island many times. His friend John Mason, son of George Mason (who was a member of the Constitutional Convention and contributed to the writing of the Constitution, but in the end, refused to sign it), built a mansion on Analostan in the 1790’s. The island, now named Theodore Roosevelt Island, retains no apparent traces of its history as the site of a plantation, luxury home, and getaway spot. It’s mostly grown wild, except for the hiking paths that crisscross its perimeter, length, and breadth, and the Theodore Roosevelt Memorial perhaps half a mile from the island end of the footpath that reaches it. The memorial appears just a little neglected: there are weeds growing through the spaces between the flagstones, and the fountain is waterless and scattered with debris, mostly just dead plant stuff. Theodore Roosevelt’s likeness, large and a little menacing-looking (calls to mind the phrase ‘bully pulpit’, though more in today’s sense of the term than his), is portrayed in the act of delivering some impassioned speech, one arm upraised. 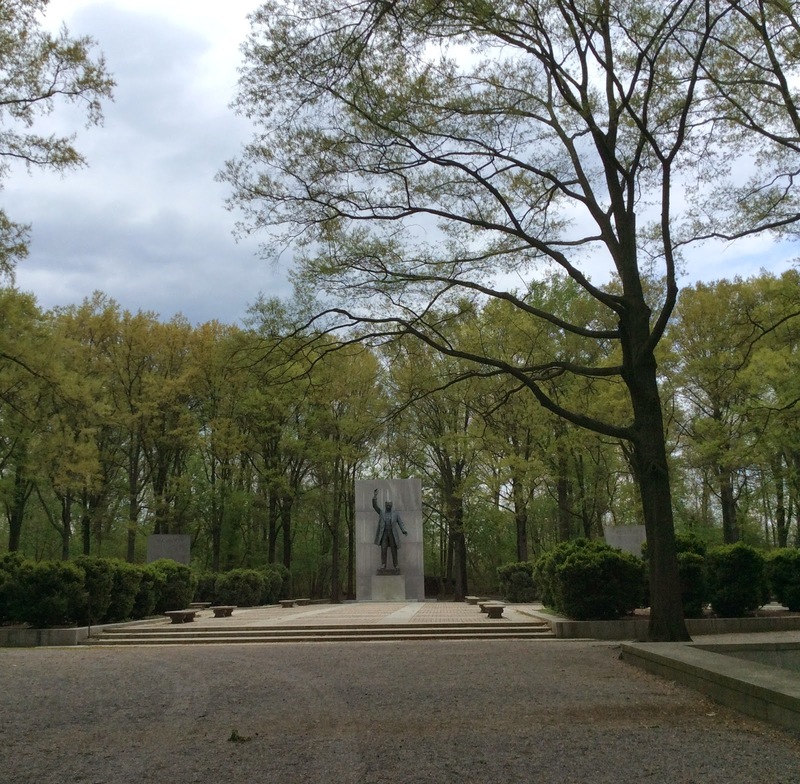 If there were a crowd here, the statue’s demeanor would be fitting; the island being nearly empty this afternoon, it looks oddly out of place with its peaceful surroundings, with no sound but birds chirping and the wind blowing through the trees (it’s another blustery day). There are large stones carved with phrases praising bold, courageous ‘manliness’ which I find a bit annoying; my feminist side protests that I and many of my fellow women are more bold and courageous than many men, and that these are human traits, not ‘manly’ ones. I’m also aware of the warmongering, reckless side of his personality, which I don’t find admirable. I prefer Jefferson’s philosophy, which places a far higher value on courtesy, reason, and compromise, with war a measure of absolute last resort (though not so for spontaneous revolution of the people when they find their natural rights are being trampled upon, that’s another matter; he considered this a desirable thing sometimes). I remember, however, that Roosevelt often used his power to promote the rights of the poor and to protect our natural resources. Parks like this, for example, as are many of the places I’ve visited this trip, are an extension of his legacy, publicly funded preservations of natural beauty and historical places that market forces nearly caused the destruction of. I forgive him and move on. 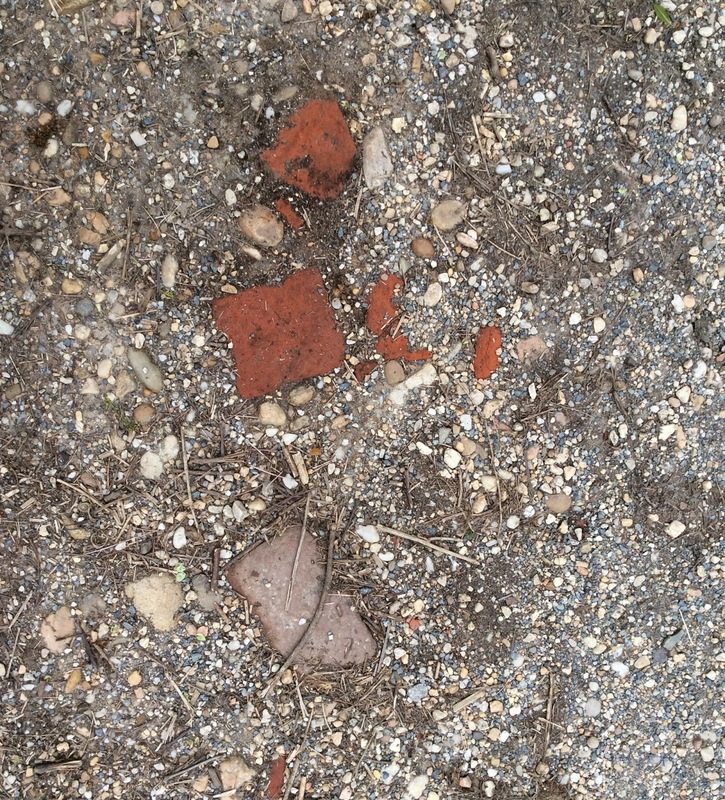 My main goal for this island hike is to find some remnant of the Mason house, since it’s the artifact directly associated with Jefferson here, and then skedaddle and swing by Alexandria, home of Gadsby’s tavern where Jefferson stayed once, on my way to the place I’m meeting someone later. But once I start tramping round the island, my inner hiker, having been starved of her exercise and natural scenery for over a week now, demands a longer stay. So I forego the Alexandria stop (which I never end up making, oh well) and hike vigorously for a couple of hours. 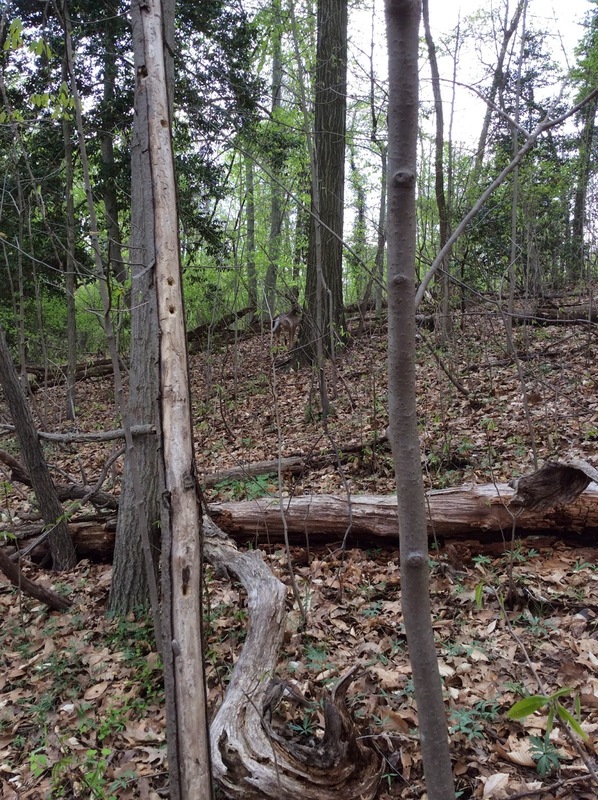 It’s mostly forest, with large area of marshland along its south and eastern end; I start my hike on the trail that goes through it from end to end, counterclockwise around the island. Much of this path consists of a wooden boardwalk to keep the hiker out of the water. There are birds galore, many of which I’ve never seen before and whose unusual calls I try to memorize so I can find out more about them later. At the end of the marsh walk, I return to the woods, and I crisscross the entire island time and again. I think I walked every single official trail on the island, some more than once, and some unofficial little narrow ones as well. A herd of deer and I spooked one another when I was on one of these little narrow ones. Most bounded away to my left toward the marsh, but one bounded across my path and ended up very close to me on my right. We stared at one another for awhile, then she moved on. Finally I come across what I’m looking for, sort of. I find a National Park Service Sign indicating the little rise where the mansion stood. I ascend the rise, and among the trees, find the only sign that indicates there was once a structure here: a few broken remnants of old brick. Perhaps there’s some remains below ground; how fun it would be to dig it up, if so! However, since I never did fulfill that childhood dream of becoming an archaeologist, I suppose I better not. I find the site just in time, since the time has come to leave the island for the meeting I spoke of. But you’ll have to wait ’til the next installment of my Jefferson adventure to find out who with! ‘Analostan Island’, George Mason’s Gunstan Hall website. ‘City Tavern Club: History’, City Tavern Club website. ‘History of the Forrest-Marbury House’, Embassy of Ukraine website. ‘Washington, D.C.’ Thomas Jefferson Encyclopedia, Monticello.org website. I wake up a little late, having not gotten much sleep the day before, and spend the morning going through countless photos I’ve snapped so far, jotting down notes, and writing up some of my reflections from the memorial tour on my first day visiting sites in Washington, D.C..
Then, I take the Metro to L’Enfant Plaza station, and walk south towards my first destination. By the way, DC has a very good subway system: comprehensive, easy to use, clean, and safe. Driving in DC, by contrast, is kind of a drag: the streets and freeways form a big tangled spiderweb, so it’s easy to get lost. As a nearsighted person, I also find the street signs too small, nearly impossible to read when the only one there is located all the way on the opposite side of the intersection, especially when it’s dark or raining. 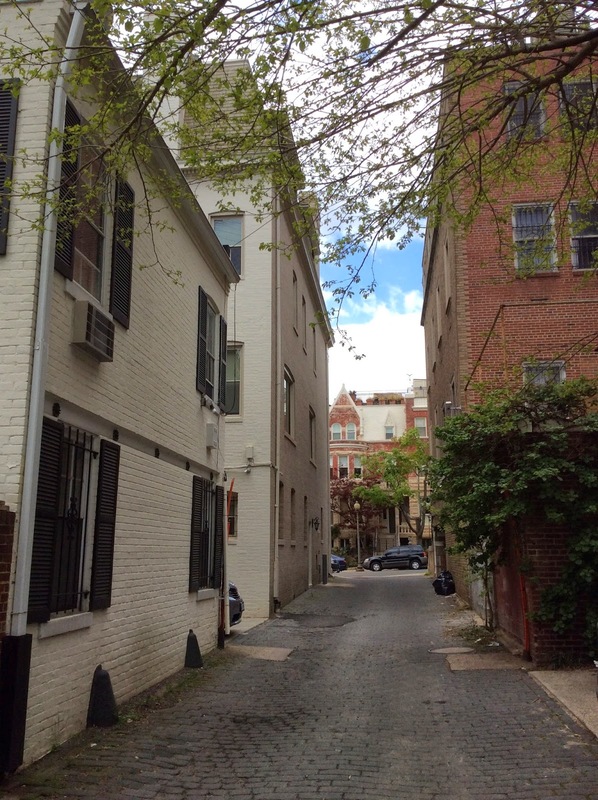 I’m heading to G Street between 9th and 10th, where a man named Notley Young owned a house that Thomas Jefferson visited in the fall of 1790. Young owned a large plantation which bordered on the Potomac and extended northeast from the river. His land, along with neighboring plantations, was obtained by an act of Congress to build the new capital city on. Jefferson, Secretary of State to President George Washington, was appointed to help with planning out the city, and the 1790 visit was part of the trip to visit landowners in the area in preparation. The first stone formally marking out one of the new capital’s boundary lines was laid the following April, 1791. There’s a promenade parallel to 10th St which, according to a sign I find here, covers the original site of the Young house. 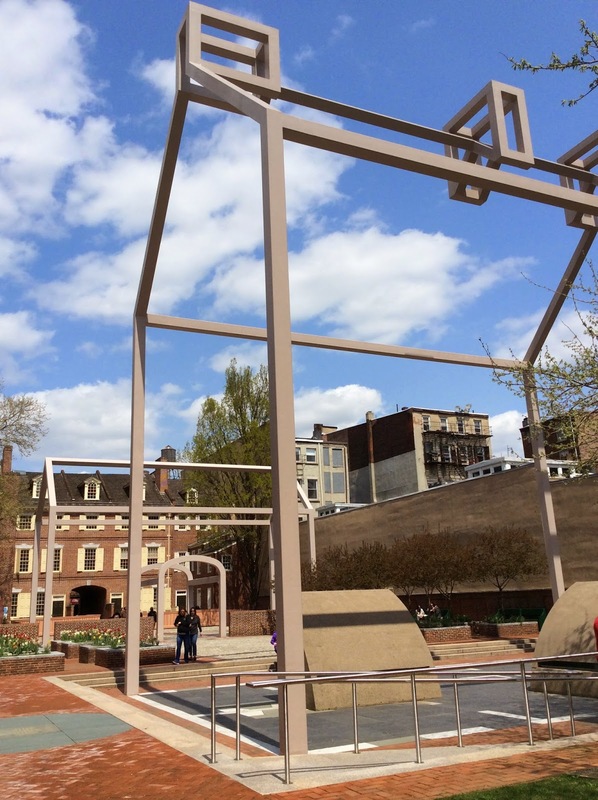 The promenade ends at Benjamin Banneker Park, which overlooks the river and is named for another Jefferson connection. You know, you could easily play a sort of Six Degrees of Kevin Bacon game around here, but for this trip, we could change it to, say, Three Degrees of Thomas Jefferson. Similarly, if you took any public landmark associated with any historical person from 1750’s – 1820’s America, you could make the connection with Jefferson using very few links every time, as he had an even longer, more prolific career in public life than Bacon has had as an actor. If I were to follow every Jefferson connection, my trip and my account of it would go on interminably, but since Banneker’s link to Jefferson is an especially interesting and illuminating one, it’s well worth exploring. This park named for Banneker, by the way, is a rather un-parklike-park, all concrete, with a dry fountain and some sparse-looking trees. I can see there’s some construction work going on around it and it’s still spring; if the trees fill out, the work is done, and the fountain turned back on, it might be very nice. It used to have a good view, I’m sure, but now it’s marred by the freeway. I had heard of the famous letter Benjamin Banneker once wrote to Thomas Jefferson challenging his views on race; back to that in a moment. What I learn doing further research is what prompted the letter in the first place. Banneker, a largely self-educated man of impressive mathematical, scientific, mechanical, and other accomplishments, accompanied Major Andrew Ellicott in 1791 to help survey the land in preparation for building Washington DC. Ellicott was working on this project with Jefferson, who, as we discussed, was another of these city planners. Someone at the time noticed, and having read Jefferson’s Notes on Virginia, editorialized the story, pointing out the discrepancy between Jefferson’s stated view that black people possessed inferior intelligence, and Banneker’s accomplishments in all manner of skilled and intellectual pursuits. So Banneker took the opportunity to use this as a teaching moment, writing to Jefferson himself. In the letter, he points out the incongruity between Jefferson’s demanding that Britain give the American colonists their freedom while he’s denying this to his own slaves. While he compliments Jefferson on his past as a champion for the rights of black Americans, he shows the inconsistency between Jefferson’s recent stated views on the innate inferiority of intelligence of black people, and the evidence, that black people can achieve as much as any white person so long as their capacities are nurtured by education. Banneker even offers to send a manuscript of his work written out in his own handwriting, in case Jefferson is distrustful. As a fellow man of science in the age of Enlightenment, he knows that Jefferson can’t just ignore evidence that’s right in front of his eyes. I head back, via the promenade, towards the east end of the National Mall, and pass the Capitol Building through the park. The clouds are blowing in, and the predicted rain which leads me to select this day as perfect for my next destination, appears imminent. As you can see, the Capitol dome is surrounded by scaffolding as it’s being restored. It’s made of cast iron, and in the mid-1800’s, replaced the original one, disproportionately small since the building’s many expansions. The first part of the Capitol Building was finished in 1800, the year the United States government moved to its official new home. Jefferson and President George Washington held a contest for the design, but none of the original entries won. A later entry by a doctor was approved, and many of Jefferson’s classical design elements, especially those inspired by the Pantheon, were included. My main and final destination for the day is the Library of Congress. The LOC is founded on Jefferson’s original library of 6,487 books, purchased by Congress in 1815 from Jefferson at a discount, its original collection having been destroyed by the British during the War of 1812. It was a mutually beneficial arrangement: Congress needed a new library, and the idealistic, projects-oriented, often impractical Jefferson needed some debt relief (he was always in debt, he loved to live large). It’s fitting that the largest private book collection of Jefferson’s time would become the seed collection of what’s now the largest library in the world. As for me, the LOC is my go-to source for published images in the public domain with which to illustrate my essays, as well as material for research. And oh my goodness: the Jefferson Building of the Library of Congress, the first and still main building, is one of the most beautiful works of architectural art I’ve ever been in in my life. I might place it next in line to Sainte-Chapelle in Paris, in fact. There may very well be more beautiful buildings than these, and if so, I look forward to visiting them! The floor and ceiling are covered with intricate mosaics, in lovely shades of rose, soft green, golden maize, gray, and white, of neoclassical decorative elements and the names of great authors and scientists, interspersed with gorgeous neoclassical and Art Nouveau paintings, allegorical and representative, representing moments in history and fields of inquiry. After my first good, long gaze at the atrium and first floor hallway, a sign caches my eye, and I follow it to an exhibit which features the first published map of the United States. It was drawn by Abel Buell, and published in 1784. As you can see, the western sides of the states follow lines of latitude past a certain point, and end at the Mississippi River. Much of the land was as yet unsettled by colonists, and not thoroughly explored by non-native people; lines of latitude, then, was a practical way of defining state borders beyond the areas originally colonized. The gallery at the southwest corner of the second floor is really what I’m looking for, and I head upstairs. I see a sign at the entrance of the Jefferson gallery announcing a special exhibit. 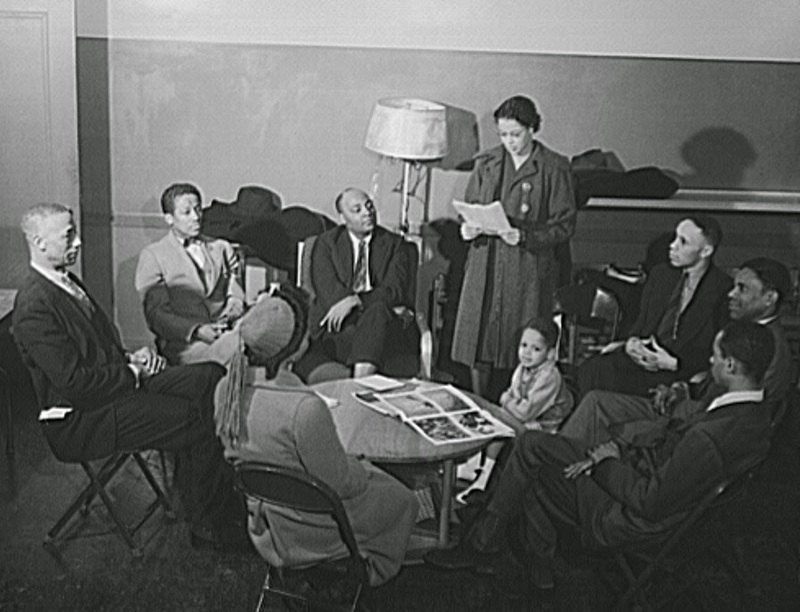 It covers the history leading up to the Civil Rights Act of 1964. I’m particularly interested in the history of civil rights movements, so I’m excited to see it. Among countless fascinating artifacts and the accompanying historical accounts, I’m struck by one which directly relates to the subject of my trip. It’s a contract between Jefferson and James Madison, drawing up the terms of a slave sale. There’s something extra disheartening about the fact that it was drawn up in 1809, after both men had served so many years in public office. This is a fascinating exhibit with so many significant artifacts, including the anti-lynching flag that used to fly over New York City from the windows of the NAACP office in the 1930’s, each time a new one occurred. Reading simply, ‘A Man Was Lynched Yesterday’, they had to stop hanging it at a certain point or lose their lease. Isn’t that amazing? Make a simple statement of fact, and get kicked out. But then again, think of how Billie Holiday was hounded until she died, persecuted by government officials just for singing ‘Strange Fruit’. The Jefferson Gallery holds what remains of the original Jefferson collection; about two-thirds of it was lost in a fire in 1851. 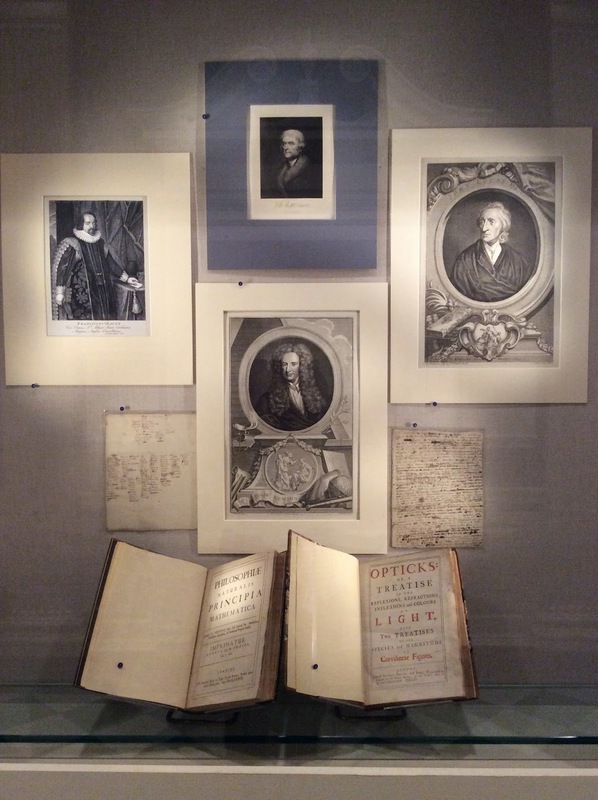 The LOC is currently rebuilding the original collection, seeking out original copies, in sufficiently good condition, of the same books in the same edition that Jefferson originally collected, if they can be obtained. The collection is beautifully arranged, in a wide open spiral of shelves walled by glass, in the same order that Jefferson arranged them on his own shelves. Instead of an alphabetical system, he used a system modeled after that of Francis Bacon, organizing them by three broadly defined subject categories. For Bacon, it was ‘Memory’, ‘Reason’, and ‘Imagination’; Jefferson personalized it as ‘History’, ‘Philosophy’, and ‘Fine Arts’. The books are marked with little colored ribbons tucked into them like bookmarks: green means it’s from the original Jefferson collection, gold means it’s recently been purchased to replace the original, and no ribbon means it’s been replaced by a more or less identical book Congress already owned in another collection. There are little book-size boxes too, with the names and descriptions printed on their ‘spines’, of books that have not been located to replace the originals yet. Jefferson was a meticulous, some might say obsessive, record-keeper, so knowing exactly what needs to be replaced is pretty straightforward. Not only did he write down which books he owned, he described them in detail, with notes about their contents, even their measurements! I love to find connections between the ideas of thinkers I admire, as well as between various theories and historical people and places. So, I search the shelves for books that he would have read, especially by people who have been featured in one of my traveling philosophy series, or will be. I know that Jefferson was very critical of David Hume’s history of England, describing it as too ‘Tory’, but I wonder if he ever read any of Hume’s philosophy, and if so, what he thought of it. (More on this shortly.) I find he owns work by Baruch Spinoza, Condorcet, and Voltaire, along with books on women’s rights, anti-slavery books, and of course, much, much more: the classics, science, philosophy, government, art, you name it. The man, as we’ve discussed before, was well-read. I pore over the shelves for a good long while, then decide I needed to take a break and look at something purely decorative for a moment again while I walk around. I see a little crowd gathering and think, oh, yes, whatever it is, I’ll look at it too. It turns out it’s the line to get to the balcony that overlooks the Main Reading Room. Great. It was my plan all along to find out more about how I could access the collection and do some research. So I stand in line, get onto the balcony, and see a vaulted, domed library room, the most gorgeous I’ve ever seen. Through thick protective plexiglass. So I think, well, that’s where I’m going next. I’m here to do research, so research is what I’ll do, and it will be in that beautiful room. I go back down and ask the lady at the front service desk how I go about this. She looks at me doubtfully, repeats several times that the room is just for doing research, and finally directs me to the Madison Building across the street to sign up. So that’s where I go, and find, as I expected, it’s very like the process of signing up to do research in the National Library of Scotland’s rare books room, takes some time, must have the proper ID, and so on. I go through the process, grab a cub of coffee, and prepare for a lovely and informative evening. I return to Jefferson Building through the tunnel which shortcuts under the street (there was a little rain falling when I had left it earlier) and turn in all my things, except writing materials, to the coat check. Guided by what I had discovered in the searchable guide accompanying Jefferson’s collection, I gather up a volume of the annotated complete catalog of the Jefferson collection, a collection of his papers, and his correspondence with Abigail and John Adams. In the catalog, I find more evidence that he had, in fact, owned some of Hume’s essays, but the notation, unusually, is incomplete, so there doesn’t seem to be evidence of which exact essays he read. Then I turn to his letters and find that he wrote to his son-in-law Thomas Mann Randolph, in May of 1790: ‘In political oeconomy (sic) I think Smith’s wealth of nations the best book extant. In the science of government Montesquieu’s spirit of laws is generally recommended. It contains indeed a great number of political truths; but also an equal number of political heresies: so the reader must be constantly on his guard. … Locke’s little book on government is perfect as far as it goes. Descending from theory to practice there is no better book than the Federalist. … Several of Hume’s political essays are good also…’ (p. 449) While this isn’t a ringing endorsement, compared with his often harsh criticism of Hume’s History, it’s almost fulsome praise. But however I search in the time I have, I can’t find any mention of whether he read Hume’s philosophical work, or what he thought of it. So this might, now, be the second most beautiful room I’ve ever been in in my life. (Still doesn’t top Sainte-Chapelle.) I do get some research done, but not as nearly as much as I might considering the amount of time I spend here; I happen to be there on a day the Reading Room is open late, and I stay for a few hours all told. Between my reading, I gaze, marveling and a little drop-jawed, at the loveliness around me, made more intense by my awareness of how vast the records of human inquiry and inventiveness are contained within its walls. Benjamin Banneker‘, Africans in America, PBS.org, Letter to Jefferson, and Jefferson’s response‘History of the Library‘, Library of Congress website. Moore, Joseph West. Picturesque Washington: Pen and Pencil Sketches of Its Scenery, History…, 1884. ‘Timeline of Jefferson’s Life‘. Monticello.org. Website of the Thomas Jefferson Foundation. ‘U.S. Capitol‘, Washington D.C., National Park Service website. ‘Washington, D.C.: Sites Associated with Thomas Jefferson’. Monticello.org. Wiki, Thomas Jefferson Foundation. http://wiki.monticello.org/mediawiki/index.php/Washington,_D.C. I wake up very early to beat rush hour traffic and head northeast to Philadelphia. 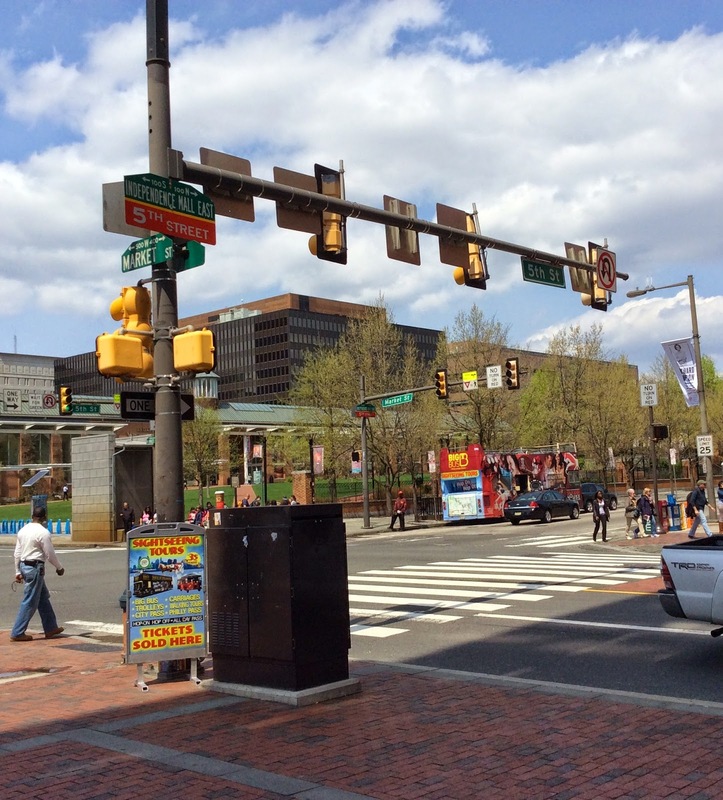 My husband Bryan and I visited Philadelphia several years ago and had explored the Old City, so I have a fairly clear memory of the general layout and some of the sites I’m looking for. But we hadn’t seen Independence Hall, where the Declaration of Independence and later the Constitution was signed, because 1) it was being renovated at the time, and the front of it was covered by scaffolding and a gigantic dropcloth printed with an image of the facade and 2) it was a weekend day during tourist season and they were mobbed by tourists, out of tickets to tour the inside by the time we got there. I had learned my lesson, and this time around, I make a beeline for the visitor’s center to get my ticket. Even on a Tuesday in April, there was an over three-hour delay between the time I get my ticket and the time I will be admitted. That’s no problem since I have plenty of exploring to do, but if you plan to go sometime, my advice is to get your ticket as far ahead of time as possible. I start my wanderings with the President’s House site, where the first two Presidents of the United States, George Washington and John Adams, had lived while the White House was being built. (Adams moved in to the unfinished White House in 1800, during the last months of his presidency.) Jefferson visited this house many times during both of their administrations. The foundations exist and were excavated and studied, and now have an open-air exhibit there, which was brand-new when we were there years ago. It’s a lovely exhibit, not only describing the house and the presidents and their families that lived there, but telling the stories of Washingtons’ slaves, left out of history until recently. More on this in a later piece. 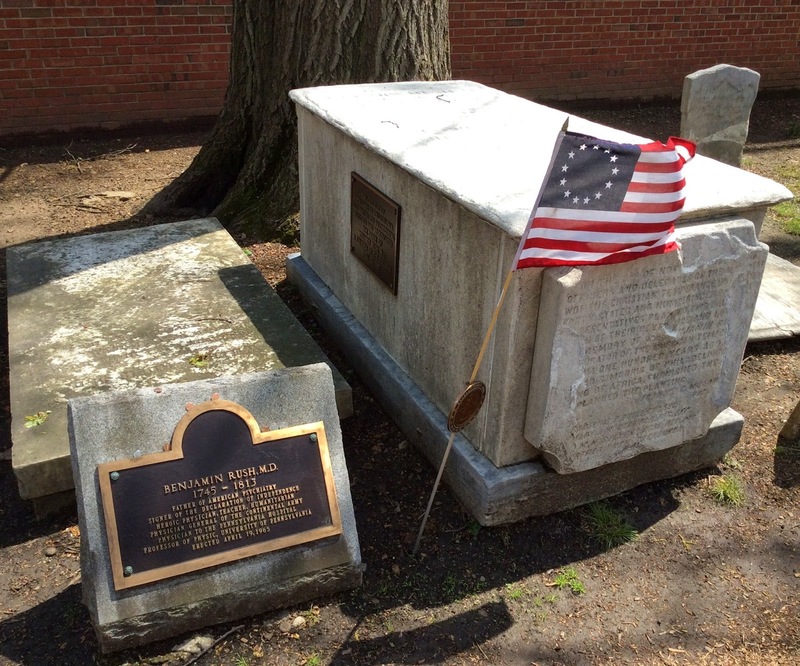 Next, I visit the Christ Church burial ground across from the Free Quaker Meeting House, where Jefferson’s friend and personal idol Benjamin Franklin is buried. I head first to Franklin’s tomb, where he lies with his wife and members of his family. Franklin had the virtues Jefferson admired most: he was a curious, adventurous, learned, and sociable man; a gifted politician, diplomat, storyteller, and above all, a scientist. In other words, Franklin was the embodiment of the ideal Enlightenment man. More about Franklin to come. When I ask one of the men attending the gate where another of Jefferson’s colleagues, Dr. Benjamin Rush, is buried, he’s very glad to show me the way, exclaiming that Rush is his favorite among those notables buried here. Rush was also a great friend of Jefferson’s and frequent correspondent, and without his efforts, Jefferson and John Adams may never have resumed their friendship, which had been strained by the infighting among Washington’s administration between Adams and Federalists and Jefferson’s Republicans, and broken by their contentious presidential races. The man who showed me the way is right: I would find Rush an excellent subject of another history series like this in his own right, as he lived a long, fascinating life. In addition to his role as a founding father of the United States, he cared deeply about important social issues and founded or served in several public service organizations. He was also curiously backward-thinking and innovative at the same time as a physician: for example, he continued to practice and promote blood-letting as a medical cure even as the medical field was doubting its efficacy and phasing it out, and had rather medieval-sounding theories about how disease is spread; yet, he was a pioneer in the study of mental disorders, describing them diseases of the mind instead of ‘spiritual’ maladies, and is often referred to as the founder of American psychiatry. I discover that Francis Hopkinson is buried here as well. He was another good friend of Jefferson’s, a fellow signer of the Declaration of Independence and fellow member of the American Philosophical Society; he helped lead its revival after the Revolution. ‘Philosophical’, in that time, was a broader term than it is today, referring to inquiry into everything that exists and how it all works; scientific inquiry was included. Franklin put it this way: the APS was a foundation dedicated to ‘the promotion of useful knowledge’. (I prefer Franklin’s description to today’s conception of philosophy and approach it much the same way.) More on the APS shortly. Then on to the corner of 5th and Market, where Mary Houses’ boarding house stood. There’s nothing now marking the site that I could find. After the death of his wife (Martha Wayles Skelton Jefferson to the rest of the world, Patty to him) in September of 1782, he was inconsolable for awhile. His friend and protege James Madison helped persuade him to go to France, where he could assist in negotiations with Britain over the Treaty of Paris. He took his oldest daughter Patsy with him. The two had grown very close after Martha’s death, and he wished her to receive some of her education in Europe. The treaty ended up being finished before the weather would allow for the journey overseas, and after a stay of a couple months or so, he returned to Monticello, then on to other government positions. He was appointed minister to France in 1784, and returned to stay at Mrs. Houses’s, with Patsy, on their way to Paris again that summer. 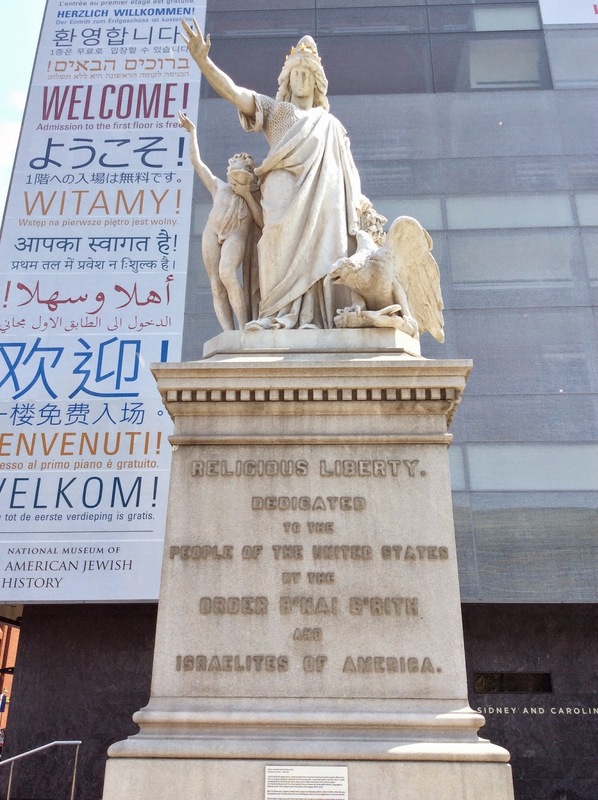 As I turn around to head to my next destination, I notice a beautiful statue in front of the National Museum of American Jewish History, across the street from where the boarding house had been. It’s entitled ‘Religious Liberty’. There was a historic exchange between George Washington and his administration, of which Jefferson was Secretary of State, and the Jewish community of Newport, Rhode Island, which was an important moment in the new nation’s history of establishing a completely secular government which tasked itself with defending the right to complete religious liberty. (We’re still figuring out how to best go about it to this day.) Jefferson had made the establishment of religious freedom among the most important missions in his life; he directed that his authorship of the Virginia Statute for Religious Freedom be one of only three of his accomplishments carved on his tombstone. For a nation which had just separated themselves from the Old World, torn apart with one bloody religious conflict after another over for centuries, religious liberty was a wonderfully freeing, invigorating, humanistic social experiment. Then on to a site at the east end of the Bourse, a funny name for the old commodities exchange building, now a retail, dining, and business center. (It’s so nice inside, I’m tempted to stop here for refreshment, but it’s still early and I have much to see.) Francis’s Tavern used to stand here, on Fourth Street between Market and Chestnut. Jefferson lived here for awhile while he was Vice President in the late 1790’s until the government moved to the new capital in 1800. John Adams and many other government officials stayed there as well. I go next in search of the site where Benjamin Randolph’s house used to stand: I know it’s not there anymore but I’m hoping for a plaque. 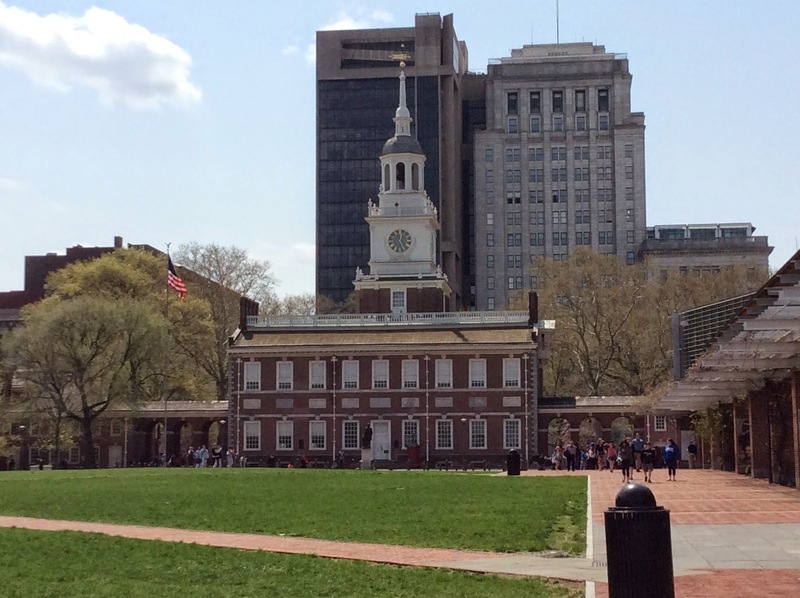 After all, it was the first place Jefferson stayed in Philadelphia; he rented rooms from Randolph, cabinet maker, in 1775 when he arrived on June 11 as a newly elected member of the Second Continental Congress. The Hall is open to the public, so I go inside. I ask a man attending the door, and a woman working behind a counter, if either of them knows of the site I’m looking for, but they don’t. The woman helpfully goes to her computer to see if she can find anything, but no luck. I’m glad I asked though. By way of explanation as to why the site may be lost to history, the man tells me a brief history of how the National Park service took over Independence Hall and the Old City area of Philadelphia in the 1950’s, and the shockingly careless and reckless way they went about ‘restoring’ it (by today’s standards). The old buildings were crumbling and crowded by shabby, more modern buildings, and the city quickly had much of them condemned so they could be cleared away and the character of the old city could be revealed. So, the man continues, the National Park Service ‘marked everything with an X’ that wasn’t immediately identifiable as having to do directly with the founding of the nation, and the wreckers went to work. Philadelphians who knew the city and its history better, however, started flooding the NPS and city officials with letters, informing them that they were knocking down important historical buildings, among them the first military building of the new nation, to the right and in front of Carpenter’s Hall (which they rebuilt from the rubble they had just made of it; you can see it in the first photo of the Hall above, to the right of the cobblestone alley) and Gilbert Stuart’s house, painter of some of the most iconic portraits of Jefferson, Washington, and other founders. OOOPS!!! The man’s story reminds me of what I discovered in NYC in my Rose and Stanton series, that until very recently, we Americans had a distinct lack of appreciation for our historical architecture. In the restless pursuit of progress, we went about knocking our old buildings down with wild abandon, as long as someone could make a few bucks by doing so. Much of our history has been lost in this way, and in my opinion, many United States cities have been uglified as a result. Sigh. I wonder if this is part of the reason why Europeans historically have disliked and distrusted American tourists. I’m glad to say we’re much better about such things these days. Then to a reconstructed 18th century garden behind the old Todd house. The garden is pretty, with lots of gorgeous tulips and trees with their new tender springtime leaves, but like the old-style gardens behind the Governor’s Palace in Williamsburg, too rigidly geometric in design for my taste.John Todd’s young widow Dolley married Jefferson’s close friend, protege, and ‘Father of the Constitution’ James Madison just a year after Todd’s death in 1793. (If it seems a little heartless to move on so quickly, well, what else could a woman do in those days? It was either be married and have social standing and financial support, or single, jobless, and unless you inherited money, penniless.) Anyway, it’s a handsome house, but just like the others. 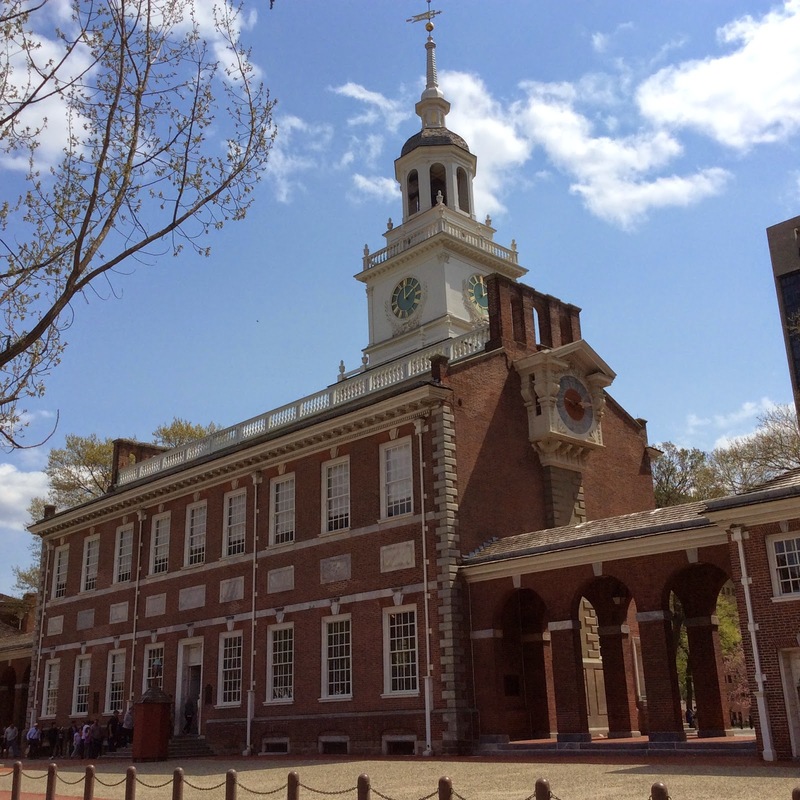 I suddenly notice how quickly time’s passing, and I hurry back to the Independence Hall square to queue up for my visit, since there’s a security inspection first. 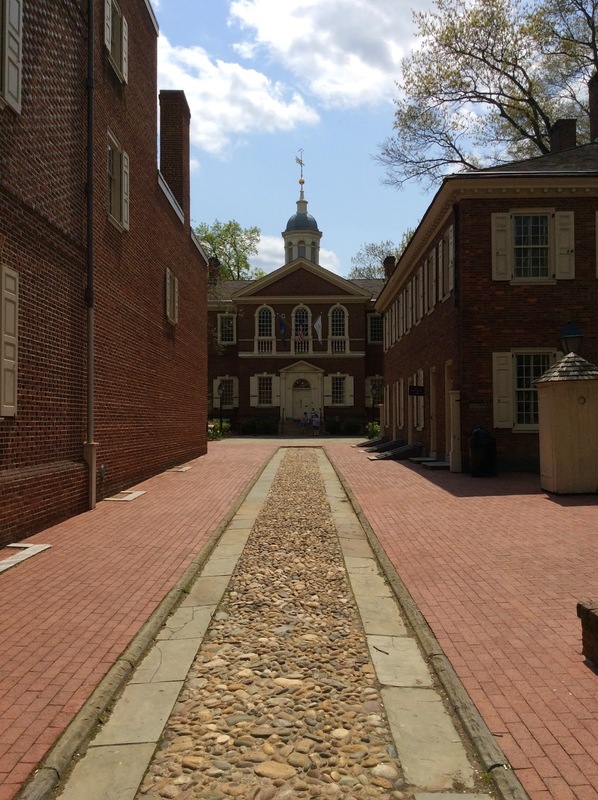 After I’m cleared and waiting with the tour group, I find I’m actually standing right next to my next intended destination, Philosophical Hall (one of the two halls of the American Philosophy Society), behind and to the left of Independence Hall if you’re facing it from the front. 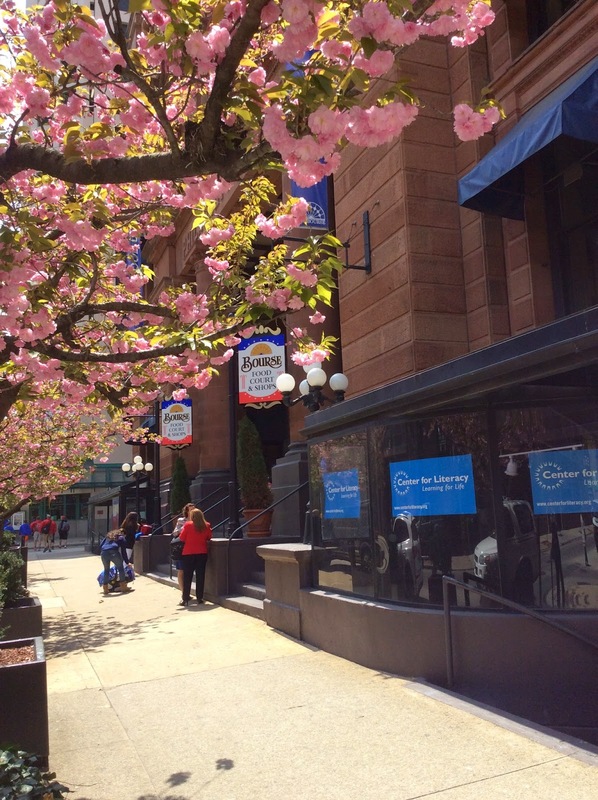 I’m so disappointed to find that the APS museum, which has an amazing-looking Jefferson-and-science exhibition going on right now, is closed, and will not be open again till Thursday. So, so sad! because I won’t have the chance to get back before I leave. My first big disappointment of the trip. 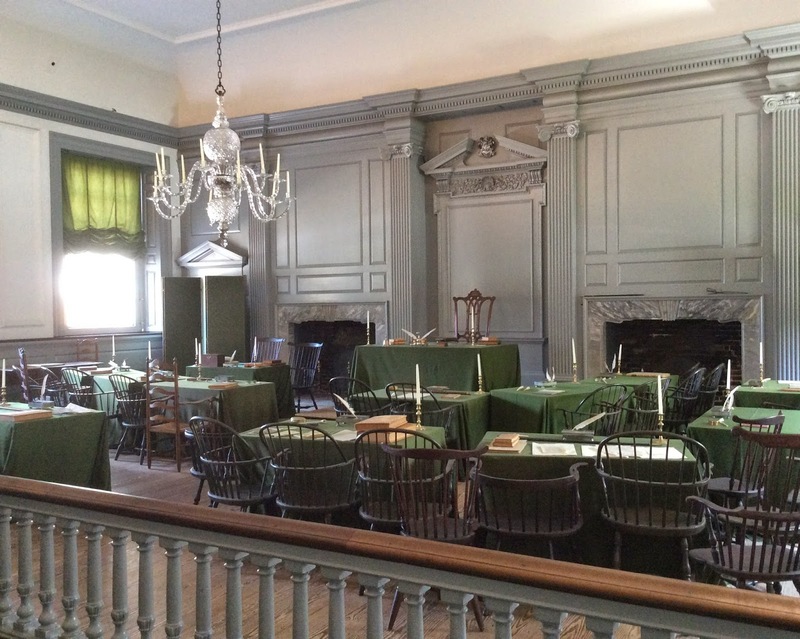 But anyway, I do get to go inside Independence Hall, beautifully restored. I discovered that the only original artifact here, besides the building itself and its architectural accoutrements, is the large chair on which Washington sat, presiding over the room on its dais in the center of the long wall. Here, Congress conceived of the Constitution, debated its contents, signed it, and voted it into law. Cool. After wandering around Independence Hall and getting a good look at it from all sides, I find, in front and to the right, the place where Jefferson’s hero Washington (hero in integrity and military prowess, but not politically or even intellectually) was sworn in as the first President of the United States, as was Jefferson’s dear friend and despised political enemy Adams. The first sessions of the Senate and House of Reps were also held here, until the new capitol building in Washington D.C. was finished in 1800. 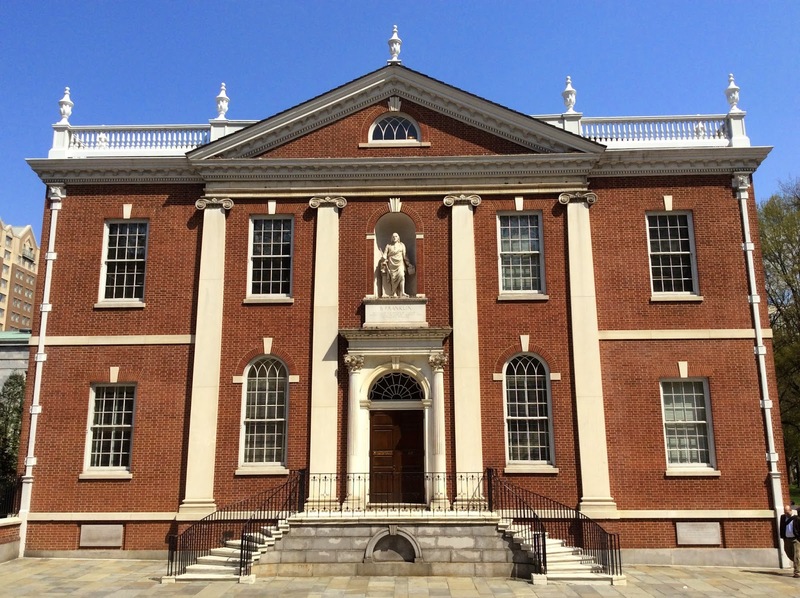 I leave the Independence Hall grounds and continue my tour around the corner down 5th Street, where the American Philosophical Society’s beautiful Library Hall stands (across the street from Philosophical Hall). It’s a reproduction of the original, with a grand statue of its founder presiding over its facade in a large central niche over the front entrance. As aforementioned, the APS was founded in 1743 by America’s most-loved brainiac, Ben Franklin. Franklin was America’s native scientist extraordinaire, and spent his life conducting scientific experiments, disseminating knowledge to the public as widely as possible, participating in politics, and traveling the world. In other words, he lived out the virtues and carried out the practices of Jefferson’s designated ‘Three Greatest Men’ Francis Bacon, Sir Isaac Newton, and John Locke. Jefferson admired Bacon for his primary role in inventing the scientific process of observation, theory formulation, and experiment; Newton, for his brilliance in mathematics and logical reasoning and his radical new approach to physics; and Locke, for re-evaluating human nature and their rights and formulating a new political theory more in keeping with human dignity. The exhibits in the main entry hall are fascinating and beautifully laid out. 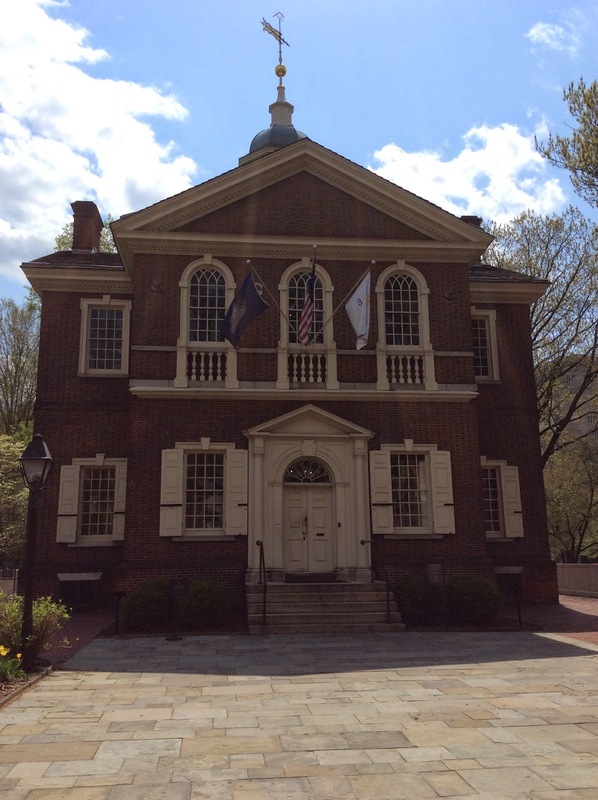 I leave Library Hall and return to where I had left Todd house earlier to hurry back for my Independence Hall tour. 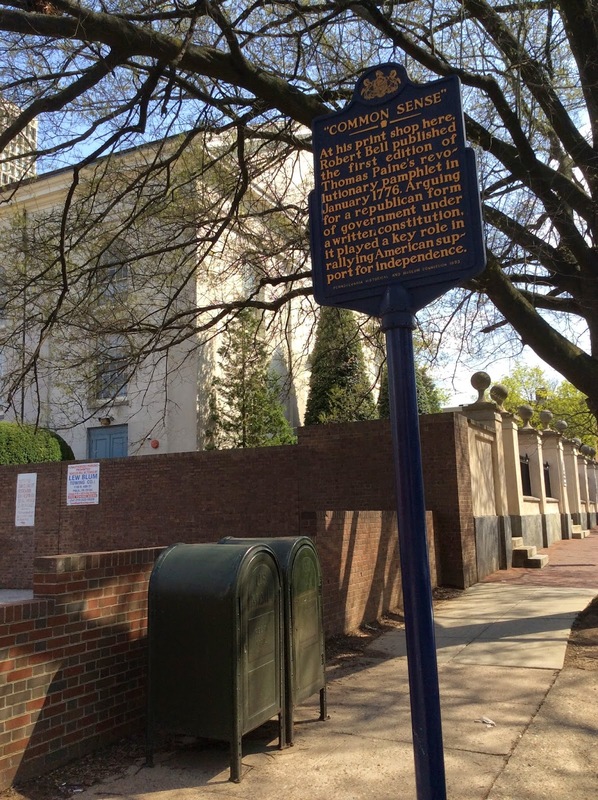 I find what I’m looking for: the site of the aforementioned Dr. Benjamin Rush’s house, down the street from the Todd house on Walnut, at the 3rd Street end of the block. Jefferson visited this house regularly. I continue my tour to the site of Robert Bell’s print shop. 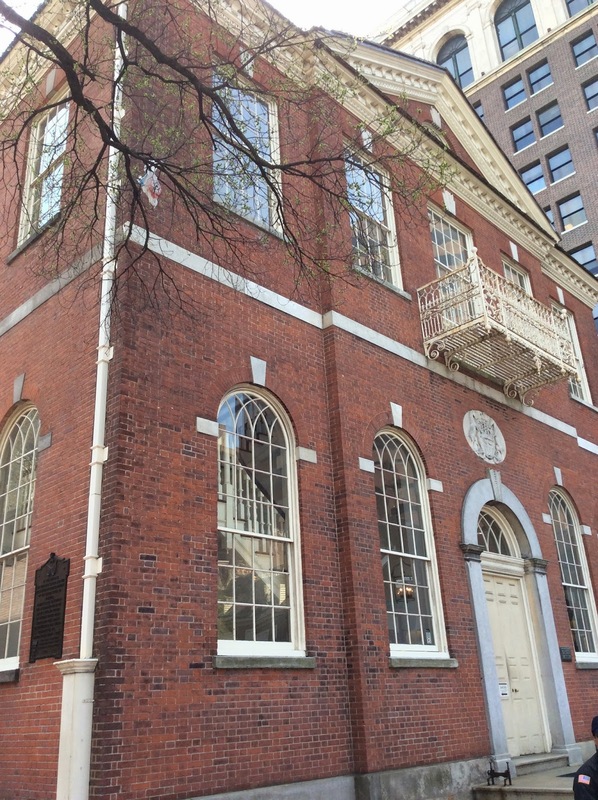 The first edition of Thomas Paine’s ‘Common Sense’ was printed here in January of 1776. As you probably know, Paine’s pamphlet was the most famous and most eloquent exposition of the colonies’ cause for independence from Britain, and did more to popularize and gather support for it than any other publication. Jefferson was a great friend and admirer of Paine, and shared not only his political views, but many (yet not all) of Paine’s progressive religious views, probably best described as Deistic with shades of Unitarianism. In fact, Jefferson remained a staunch supporter of Paine even after his reputation suffered and most of his friends abandoned him following his publication of his anti-clerical, unorthodox ‘The Age of Reason’. Always the champion of freethought and religious liberty, Jefferson put his money where his mouth was and put his own political career at risk by welcoming Paine as an honored visitor to the White House. 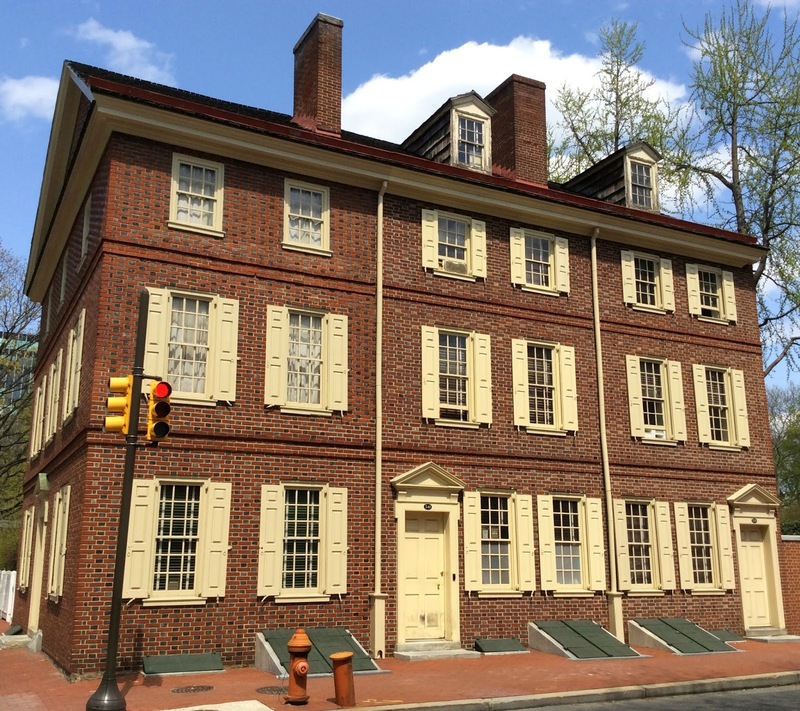 I realize I’ve been a little haphazard in my site-seeking, and should skedaddle back to re-visit Declaration House, a little museum where Jacob Graff’s house used to stand, just outside of the Old City area at 7th and Market. Jefferson lived here in 1776, where he wrote the Declaration of Independence. I had visited this site a few years ago during my visit years ago with Bryan, but this journey I’m on won’t really be complete unless I return for at least a brief visit. Graff’s actual house is no longer standing, just the house that was next to it, but I remember that the original rooms were carefully re-created. I arrive to find that the Declaration House, the museum, the old house next to it, and the grounds are closed ’till summer at least, according to the guard standing watch, due to construction around the site. 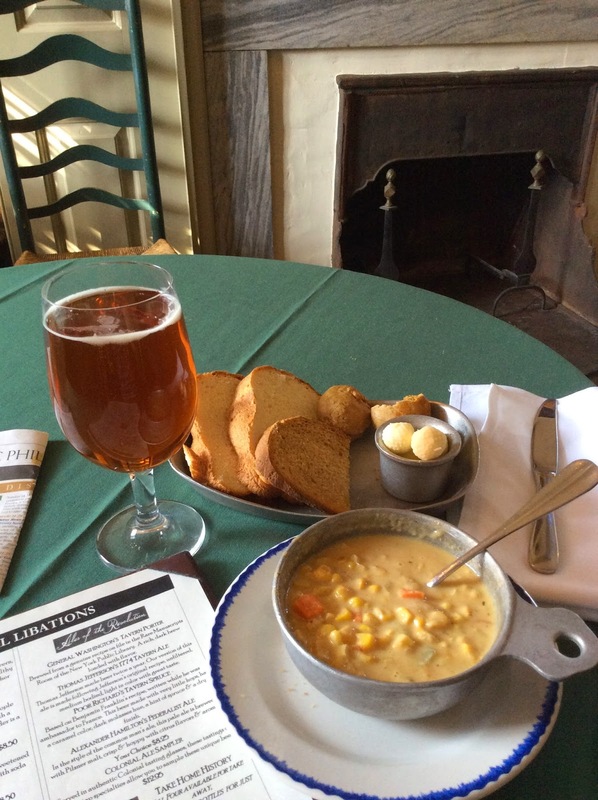 Last but not least, I return to City Tavern, where, because I can very sentimental at times, I pay way too much for a ‘Thomas Jefferson ale’ as I had when I was here years ago with Bryan, and accompanied it with some indifferent (yet welcome, since I was tired and hungry) soup and bread. Jefferson spent a lot of time in the original City Tavern, and ate a lot of his meals here, as did Adams and Franklin, among others; the one I’m sitting in is a reproduction, built very recently in 1975, but faithful enough to the original style that it’s hard to tell at a glance that it’s not an original artifact. 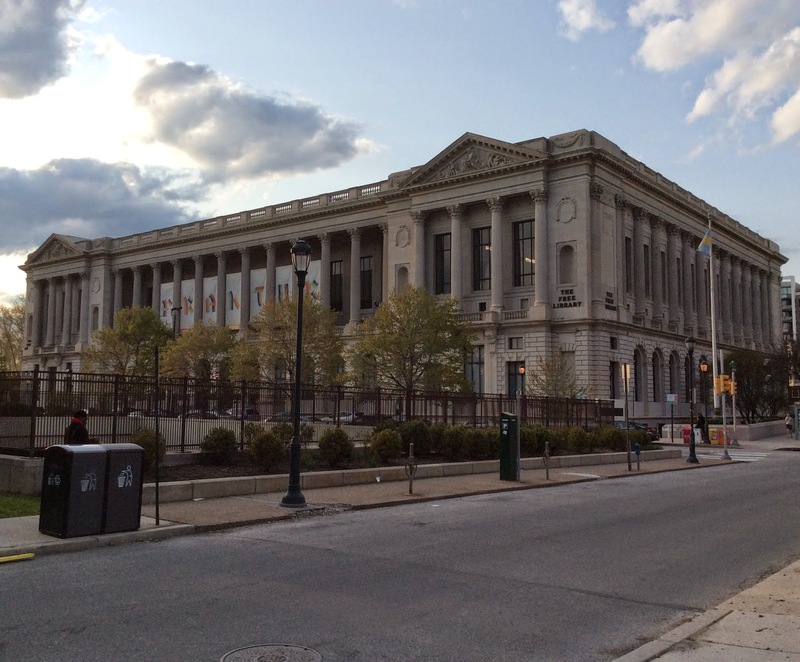 Then off on a happy early evening stroll across Philadelphia’s beautiful and vibrant downtown, to grab a coffee and sit down in the lovely Belle Arts public Free Library to type up my notes.It’s been a very long, fascinating day. ‘Benjamin Rush‘, Penn Biographies, Penn University Archives and Reference Center website. ‘George Washington and his Letter to the Jews of Newport‘, Touro Synagogue website. ‘James Madison‘, White House website. Jefferson: Writings. Compiled by The Library of America, New York: Penguin Books. ‘Religious Liberty‘, article, History page of the National Museum of American Jewish History website.